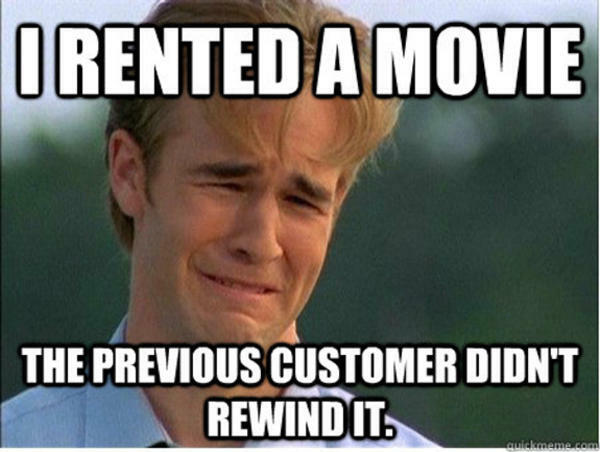 First world problems, oh the pain! I read a post today and had to respond to what I think is becoming too familiar these days, the stupid comment on first world problems. We all have real and painful issues, but sometimes, some people take it way too far. Let me give you an example. “There’s few feelings worse in this world than going on Netflix, planning to watch a movie or show, and then realizing it was pulled from the instant streaming list the day before,” writes Bryce Olin, editor of Netflix Life. Really Bryce? Are there really only a few worse feelings in the world you could have than not being able to watch Boyz n the Hood, Duck Soup, or The Bad News Bears Go to Japan! on your Netflix queue? Do you really have that kind of sheltered life that you can’t imagine what it would feel like to wake up starving, or to watch a loved one waste away from a disease, or limp to the couch to watch Netflix because you’re in pain from arthritis or have lost a limb in an accident? I could come up with thousands of worse feelings. I’m not trying to pick on Bryce or be a Debbie Downer, but I do find statements such as this utterly ridiculous and if you’re going to post something online in such a public way, you deserve to be ridiculed. Again, not trying to bring someone down but rather point out how rich and wonderful our lives are so that when something TRULY is bad—or we see someone in situation that is actual worth being concerned over—we can recognize it and take action to help. Instead of doing what Bryce suggests in his editorial (http://netflixlife.com/2014/12/26/reminder-movies-leaving-netflix-dec-31)—that is, spending as much time in the next day watching old movies—how about spending that time helping someone in need? Here is a link to the National Community Church page where you can see places to meet with others every second Saturday of the month to serve people in our community (http://theaterchurch.com/events/second-saturday-serve15). And then when you’re done and want to spend some down time with your family or just quietly alone on your couch, check out a movie or two and relax. There is nothing wrong with that—but MY suggestion is to keep your priorities in order and your problems in context. From gardens to latrines, it’s all good. 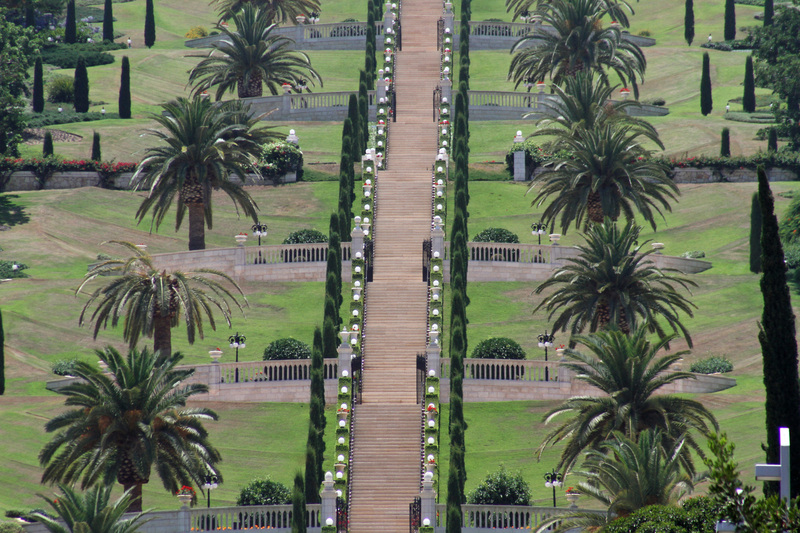 A section of the Baha’i Gardens in Haifa. Our journey through the Holy Land was coming close to the end. We reluctantly left the Sea of Galilee and made our way west back toward the Mediterranean coast. It was fun to see random ruins along the side of the road. Our guide explained that in ancient times, inns dotted the roadway and were spread apart within a day of walking so travelers always had places to stay. We drove through the Jezreel Valley, the area where Elijah worked and lived. It was in this region he met a widow and her son who were about to starve to death but fed him anyway and in return God took care of them. The drive through the country didn’t take long—it’s a pretty small country, so in no time we were on the coast at the port town of Haifa. 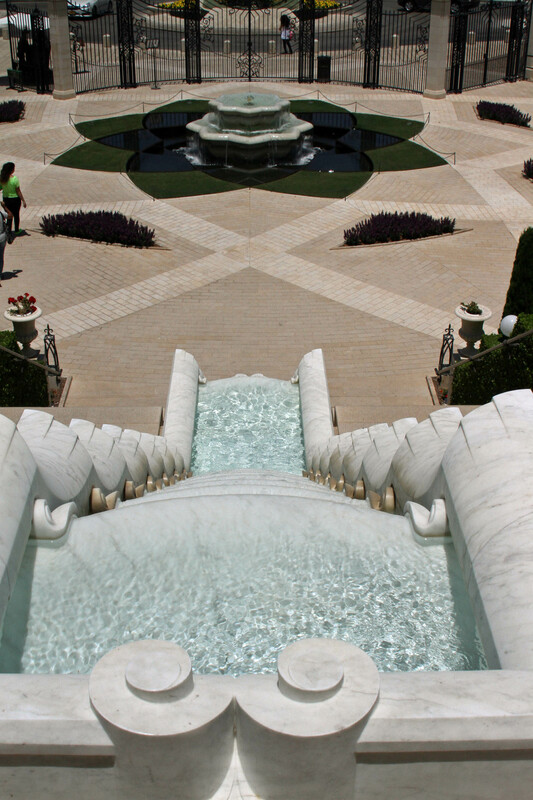 A cascading waterfall leads down to the bottom of the Baha’i Gardens. A friend of mine whose family lives in east Jerusalem and who visits her family each year, gave me some invaluable advice on what to do and see while in the Holy Land. 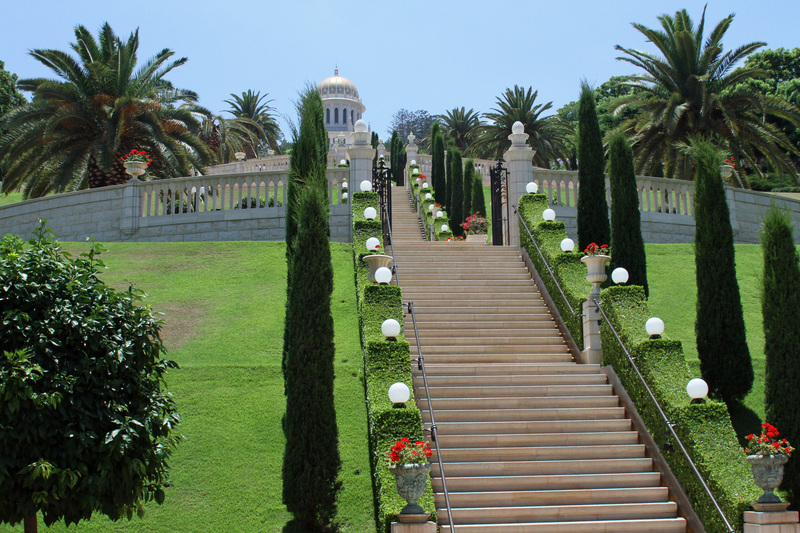 I was very grateful for her suggestions, especially the recommendation to visit the Baha’i Gardens. We parked on the street and walked up to the entrance, all along getting a spectacular view of the steep hill filled with gorgeous trees, greenery, flowers, and a waterfall. Our guide once again tried to dissuade us of going there but I ignored her and walked up to the entrance and into the gardens. I climbed up the first level easy enough and although the top portion was locked, I was able to see the garden up close. I grew up only two miles from one of the best botanical gardens in the country, Longwood Gardens, and have had the joy of seeing some beautiful artistry. But even with that comparison, I was very impressed by the clean lines of trees and flowers and the symmetry that went on and on up the hill to the temple at the top. 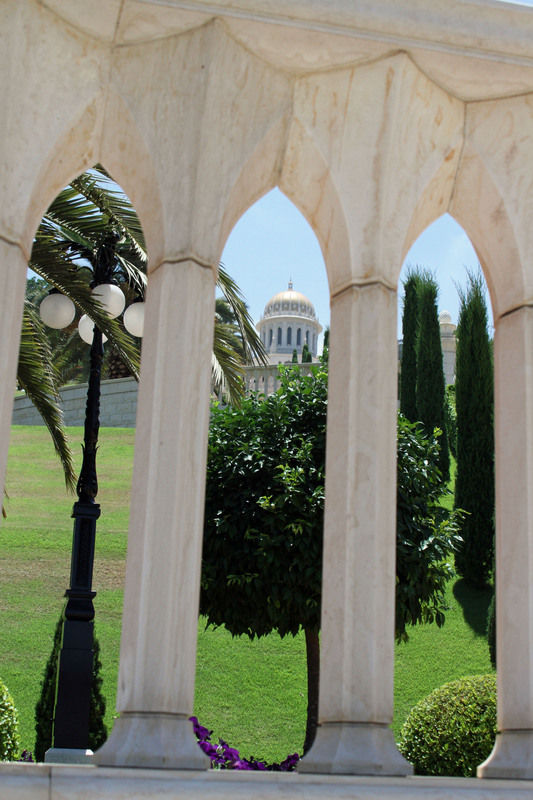 The Baha’i religion is fairly new and I don’t know much about it, but they sure do have a wonderful garden in Haifa overlooking the port and the sea beyond. From the gardens we drove to our lunch destination at a wine and chocolate shop. This was a happy place for me. We had a yummy pizza for lunch and I got to sample all four of my favorite food groups; chocolate, wine, bread, and cheese. They also had a very cool system for people who bought some sort of membership or subscription—a vat of wine stood in one of the dining areas where you could bring in your own bottles and fill them up with the current selection of wine. Yes, I want one for Christmas. Filled and smiling, we made our way to Akko. 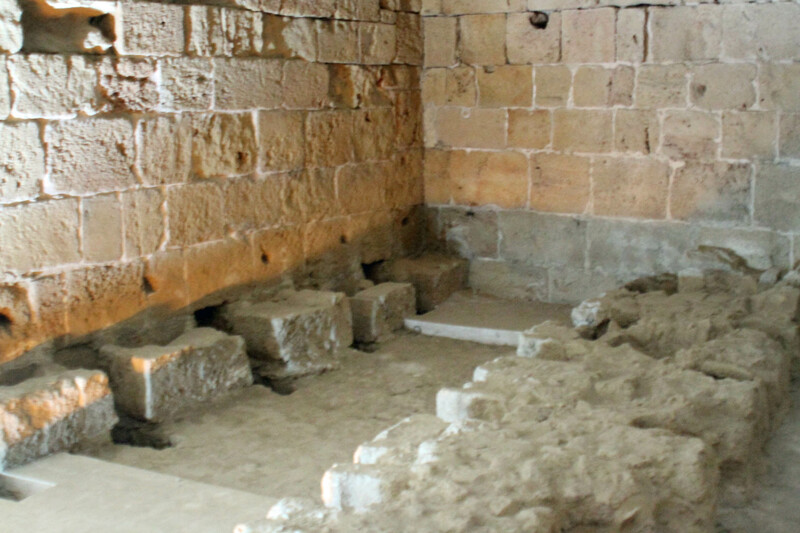 The Crusader Latrines at the castle at Akko. This ancient city’s name is spelled a number of different ways; Akko and Acre among them. 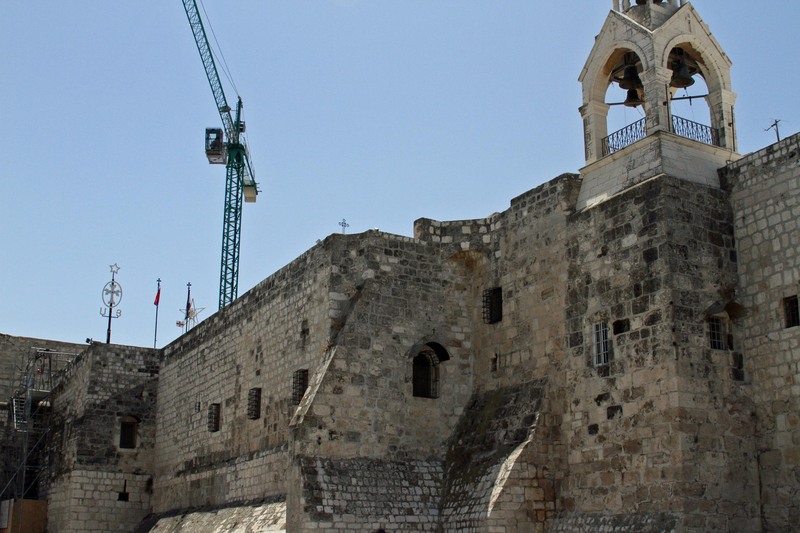 It has excavated castles and ruins, some built back in the Roman times and most of the current structure that has been unearthed stems from the Crusader period. It had been buried for a long time because the Bedouin leader who took control after the Crusaders, filled most of it with sand, knocked off the top part, and the built upon that. 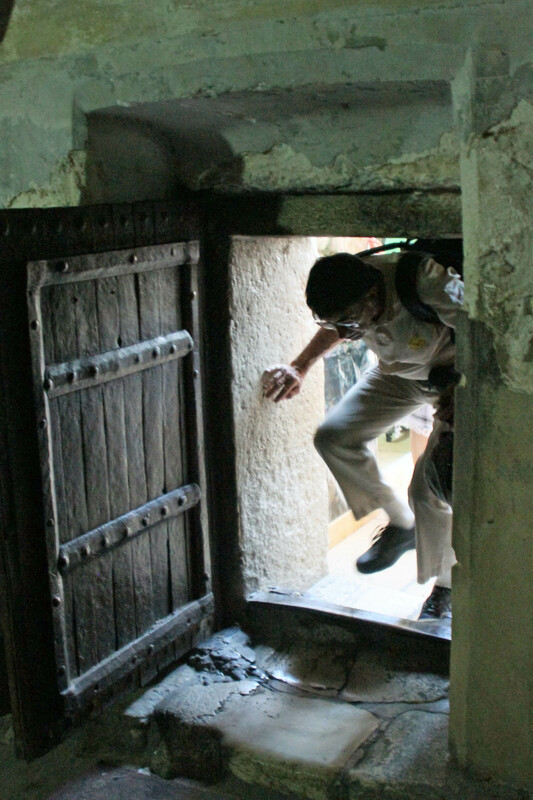 In more recent times it was used as a prison by the British during their occupation. In addition to parts of the castle including a Knight’s hall, a dining hall, tunnels, a sort of morgue, and a courtyard, we also toured a Turkish bath house (complete with a cheesy movie narrated by a fictional Ottoman). We learned a lot about the history and the centuries of invaders, but to be honest, I pretty much walked away more impressed by the Crusader latrines that had two levels, rows of toilet seats, and a sophisticated system of plumbing (at least for those days). Looking down the Hippodrome at Caesarea. This middle part is where the chariots raced around. Down the coast we made a stop at a national park that was known in ancient times as Caesarea, a city built by Herod and named in honor of the Roman Emperor. I liked touring these ancient ruins and the location was lovely. My blood pressure always goes down when I’m walking along the sea coast, so a stroll down the path along the hippodrome was calming, even with the sea spray covering us and cooling us off. We watched a great movie about the city and its history before walking up to the theatre. The seats seemed steep and we could see some of the original stone. As we descended the steps, a modern company of thespians were setting up for a concert of sorts to perform later. From there we stood among a few leftover pillars of Herod’s palace. 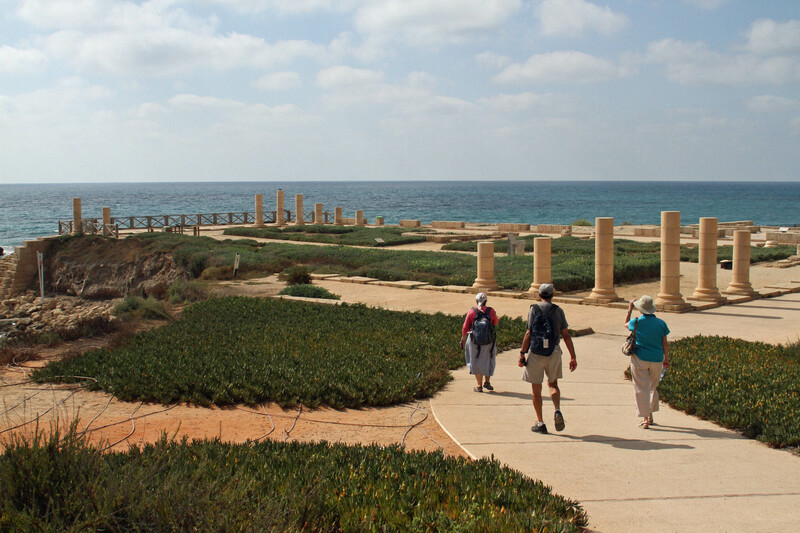 Caesarea was also the home of the Roman centurion, Cornelius, who was the first gentile convert to Christianity. He was a God-fearing man who was given a vision. He sent for Peter, who came to visit with him. This was a monumental event, because the Jews—the first apostles were all Jewish—did not mix with gentiles. It was considered an unclean act. But Jesus wanted His lessons and His grace extended to everyone and now it was time to spread the Word to all parts of the world. 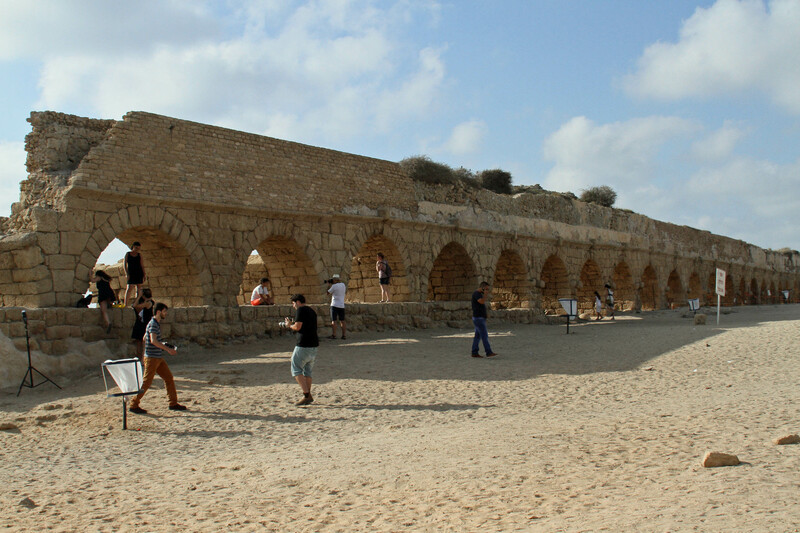 An ancient Roman aqueduct near Caesarea. Nearby we made one last stop at a section of an ancient Roman aqueduct. It was massive and stretched on for what looked like a quarter of a mile. It had large openings where some lovebirds were getting their wedding photos taken. Our final destination was Tel Aviv, which I’ll cover next time. If I climb upward on the rays of the morning sun or land on the most distant shore of the sea where the sun sets, even there your hand would guide me and your right hand would hold on to me. 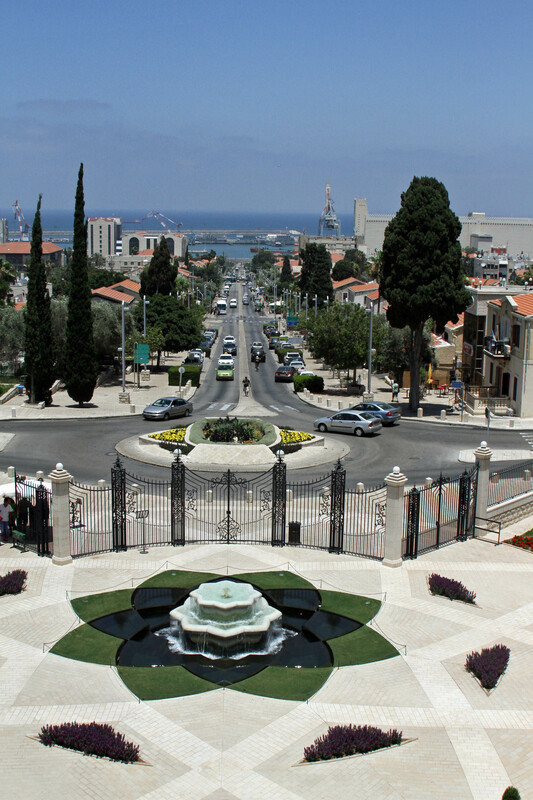 A view from the first level of the Baha’i Gardens out to the port at Haifa. Looking up the steps to the temple building of the Baha’i Gardens. 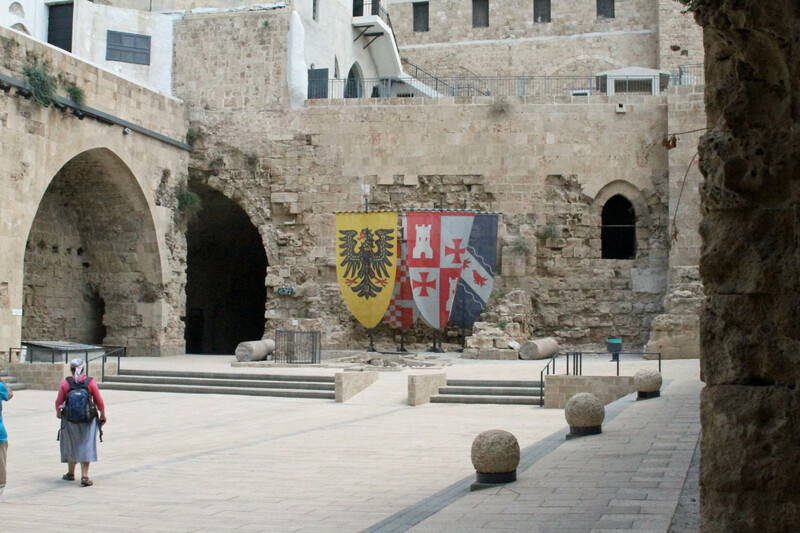 The main courtyard area of the Crusader castle at Akko. 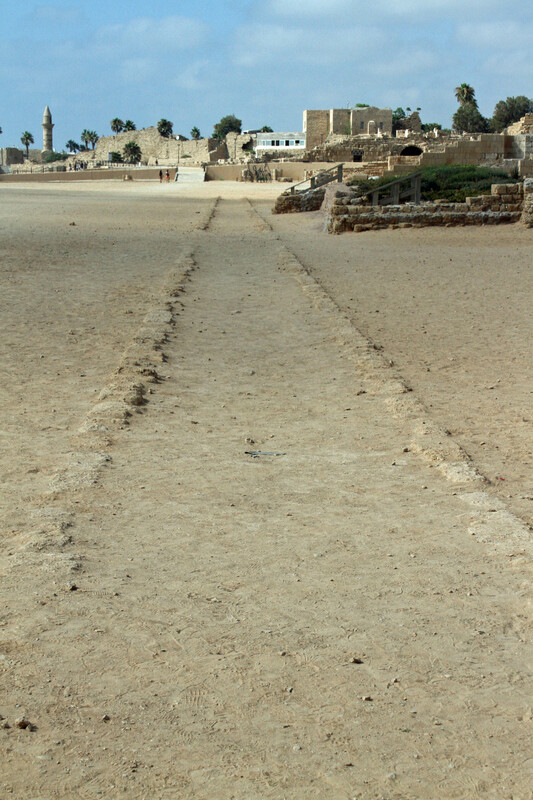 The Roman aqueduct near Caesarea. 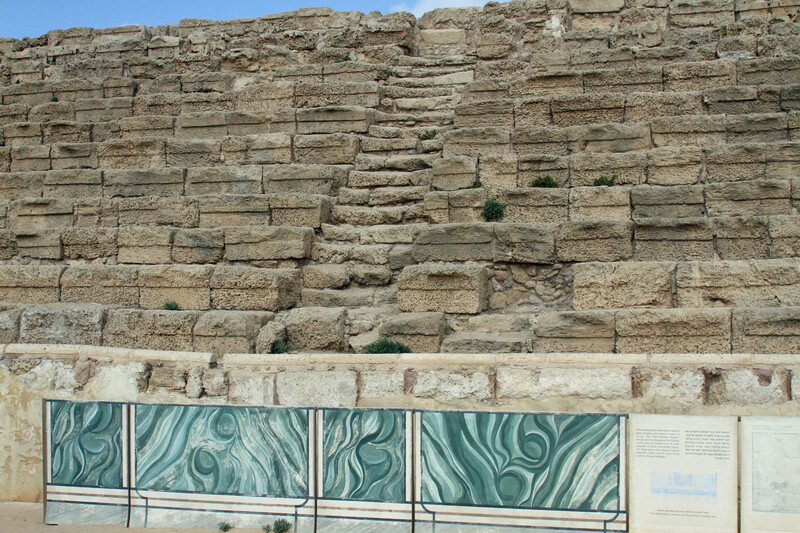 The stands of the hippodrome at Caesarea. The colored blocks are depictions of how the walls were decorated back in its heyday. The remainder of the palace at Caesarea. 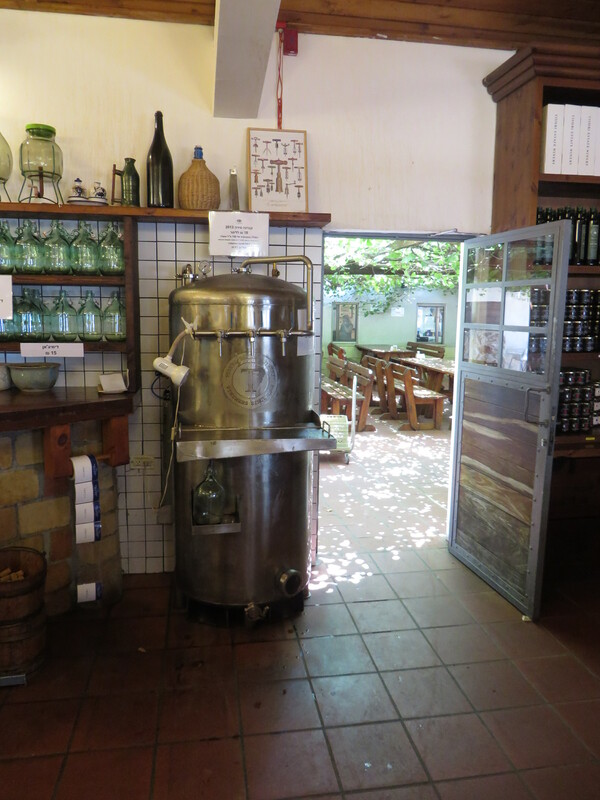 The self-service wine vat at the restaurant. Only the best wine for Jesus. A walkway at the Arbel Guest House. 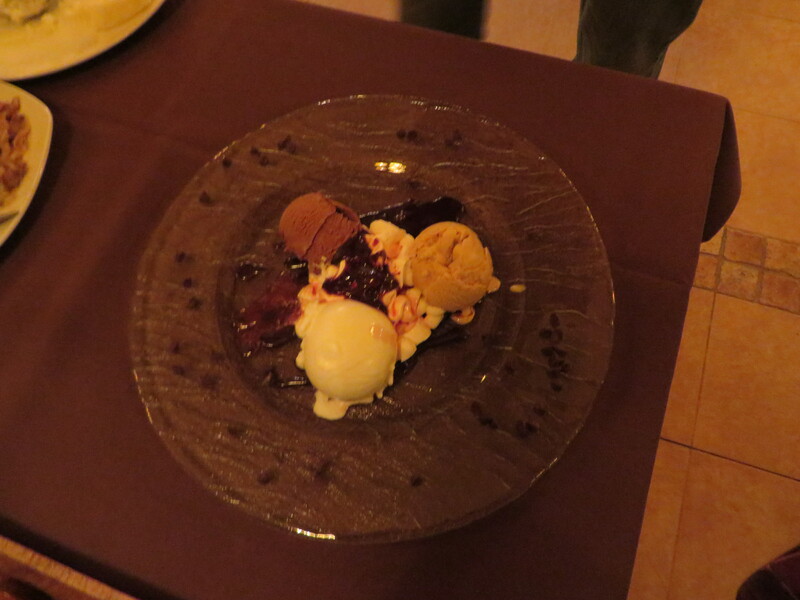 lamb stew topped with ice cream for dessert. The entire surroundings—in and out—were homey, lovely, and comfortable. At night I lingered on the patio where I watched a group of tiny kittens skirt around the property playing and looking for food. After they ran off we got more visitors—some neighborhood dogs who were very friendly and also looking for the free handouts the owners put out when the dining room closes. The family was very friendly and helpful and I highly recommend this place—it’s even easy on the wallet! 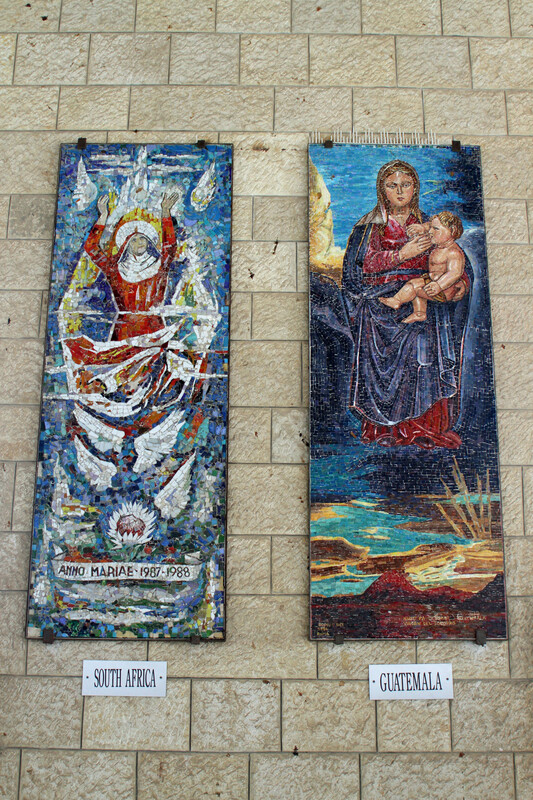 Two of the Mary mosaics at the Church of Annunciation. In the morning we were picked up by our guide and began the day with a trip to Cana, the site of Jesus’ first miracle. He was attending a wedding and when they ran out of wine, His mother asked him to do something about it, so He turned some of the water jugs into the best wine they ever tasted. The bride’s father even mentioned how good it was because normally they serve the best first and the dregs last, but this time the best wine came last. Jesus did this because He was thinking about how wonderful it was going to be when we became the bride of Christ. Here’s the context. Back in ancient times, when a woman and man became engaged, they went back to their respective homes and waited for the wedding day. At that point the man needed to build a house for his new bride and prepare a home for her. Once the house was ready to go, he could come and fetch her. When he did, everyone in town dropped what they were doing and they had a week long party (a.k.a. wedding reception). A motivated man would finish his house in a hurry. We are the bride of Christ as He is preparing a house for us in Heaven. We don’t know the exact date it will be ready, but when it is, He will come back for us and we have to be ready to go at that moment. 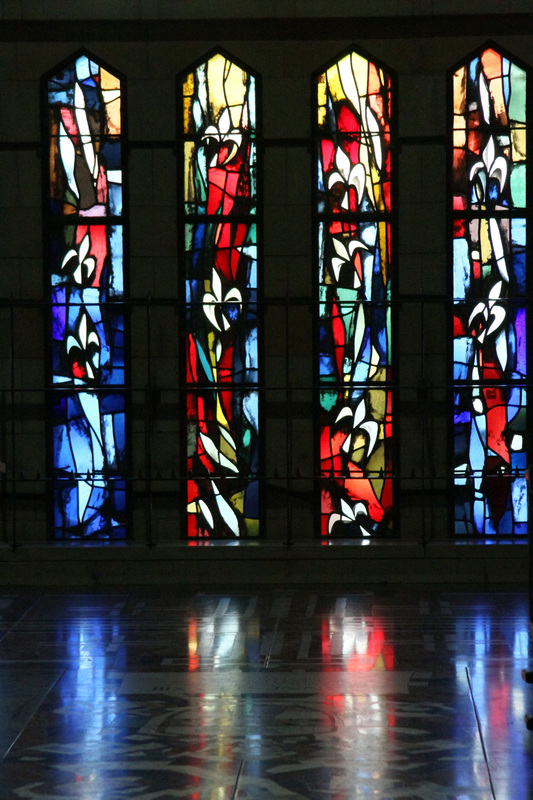 A reflective wall of stain-glass windows in the Church of Annunciation. We went to the church in Cana and spoke with one of the Monks there. He said he goes where they send him but some places are better than others. 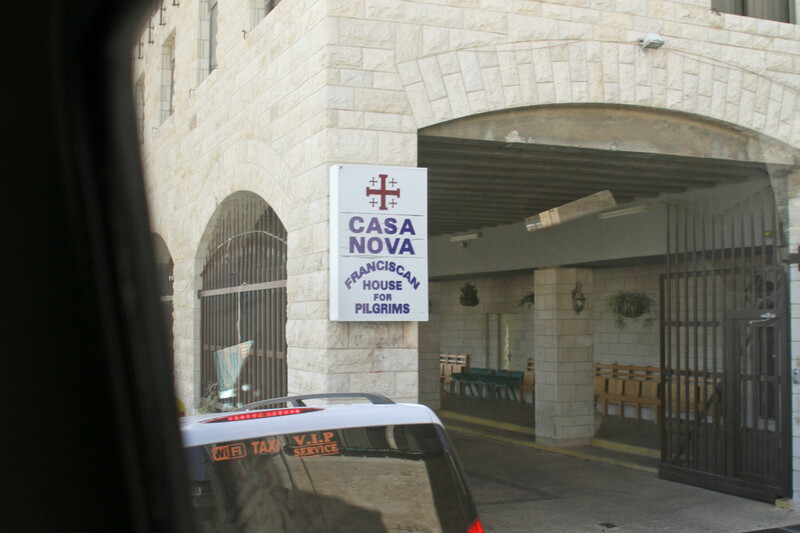 From Cana we climbed the hills of Nazareth, parked in a tiny gravel lot, and walked up the street to the Church of Annunciation where Mary was told by the Angel Gabriel that she was going to have a baby. The church was very large and quite beautiful with interesting stained-glass windows adorning the walls. Outside the church along a long porch we viewed the many mosaics of Mary and Jesus that were designed by artists from countries across the world and given to the church. 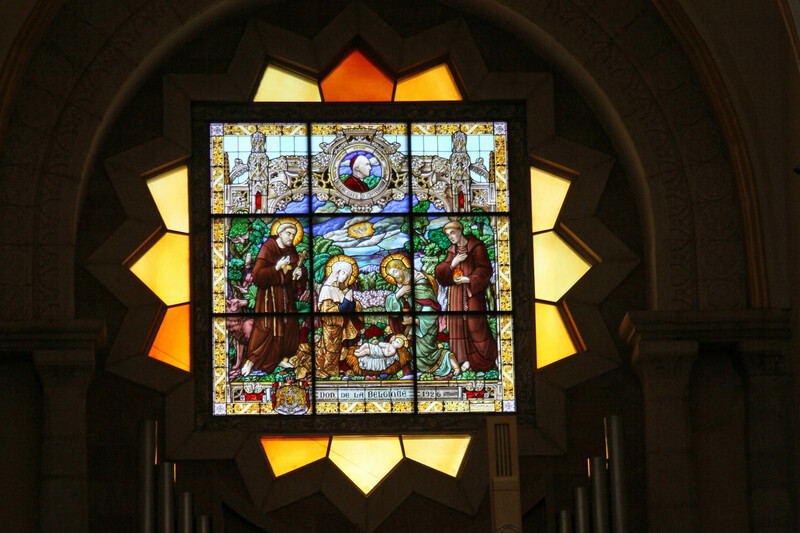 Each mosaic depicted Mary as she would have looked if she came from that culture (e.g., the mosaic from Taiwan depicted an Asian-looking Mary in clothes that are worn in that culture). Inside the church we viewed a grotto area where Gabriel spoke to Mary. 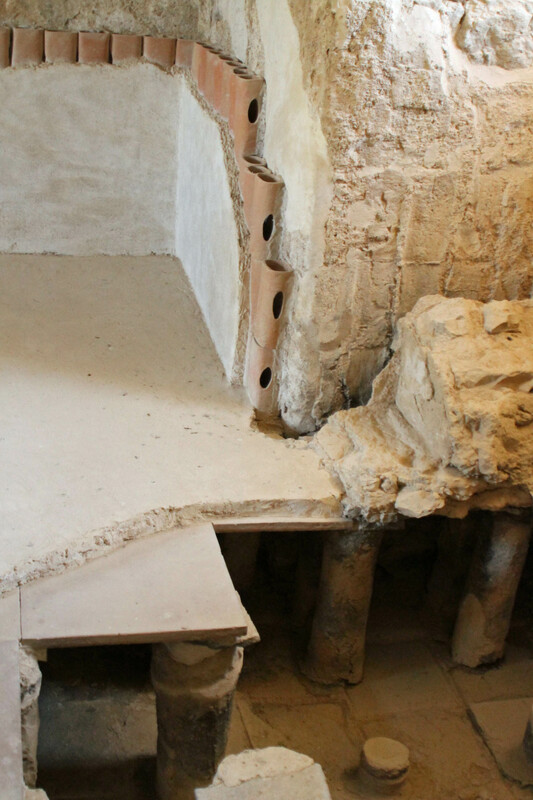 Ruins of the old town of Nazareth, which was very small, were visible underneath part of the church. 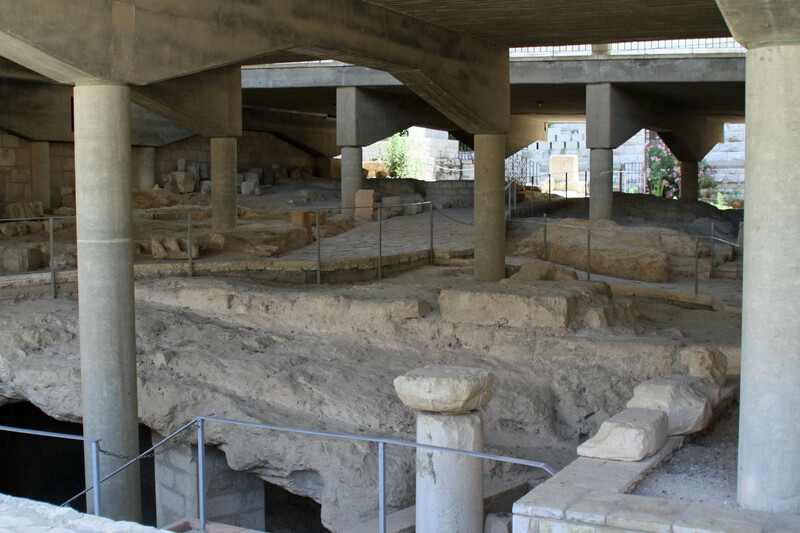 The ruins of Nazareth under the church. Somehow we made our way out of the town (no street signs in this place) and had lunch at a place called Meat the Best. We had another yummy meal with 20 bowls of salad and Shawarma. 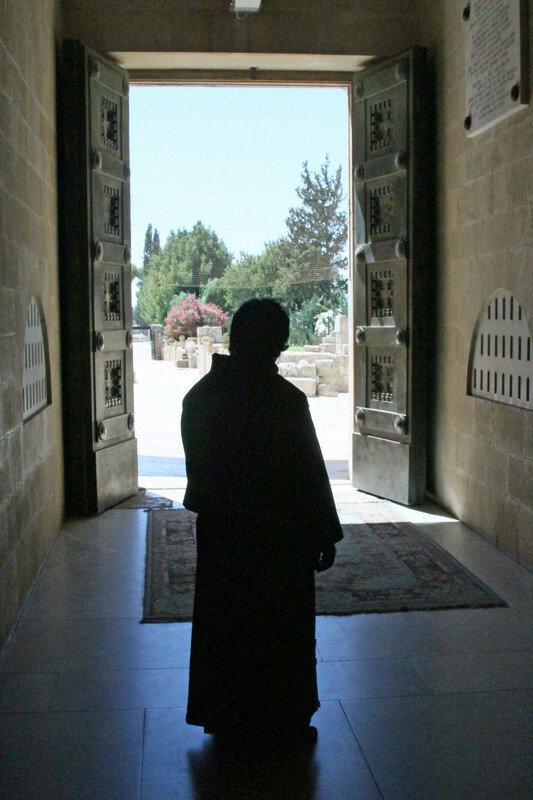 A monk meditates on the view outside the Church of Transfiguration. The church grounds were lovely and we walked around looking out over the valleys and hills around us. More beautiful mosaics lined the walls and monks wandered silently around us. Our last stop of the day was to the Tell at Megiddo. This is the site where the end of the world will come to a crescendo. The Hebrew word for mount (as in Mount Megiddo) is Har. If you put them together it’s Har Megiddo (keep going with it in its Greek form and you get Armageddon). Many major battles over the centuries have taken place here as it’s a major crossroads from and to the major cultural centers of the world such as Syria and Egypt. As we lingered at the top of the hill I could see the Jezreel valley below and the intersection of two roads. I took some video of the view (see below). Excavated ruins on the Tel at Megiddo. We walked around the site viewing the various ruins of the ancient city. There are 26 layers of ruins here—a testament to the importance of this area. And when Jesus returns, this will be the location of the last big battle between good and evil. Jesus will lead the army of heaven and defeat Satan and his cronies. I was imagining that battle as I looked at the horizon around us. Back on the road, we journeyed back to our home at Arbel and another wonderful night in the pool and hanging out with the neighborhood pets before setting out for the coast the next day. Making pancakes (or something) on the street in Nazareth. 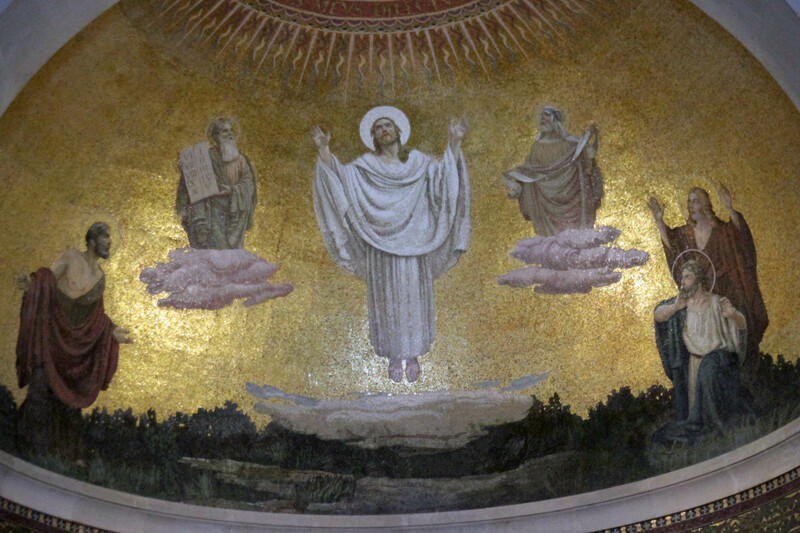 Mosaic of Jesus’ transfiguration (with Moses and Elijah and John and Peter looking on). 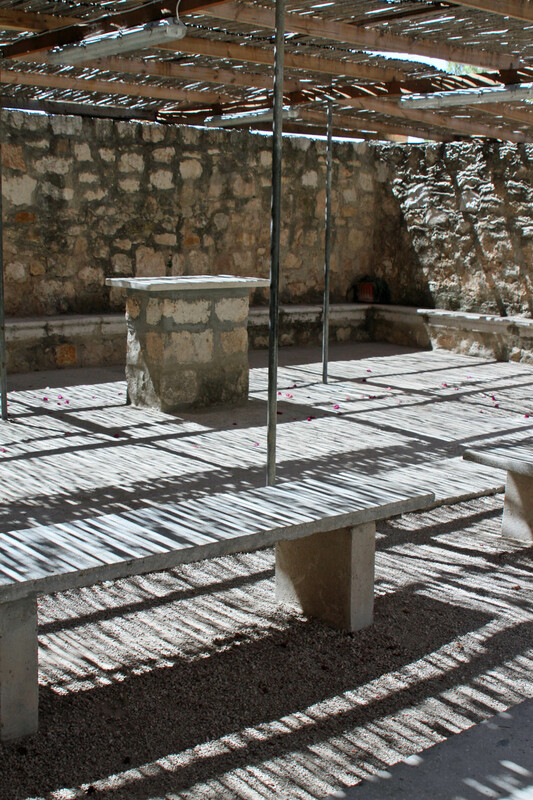 An outside altar and benches on Mount Tabor. The hot sun shines through the slits in the ceiling cover. 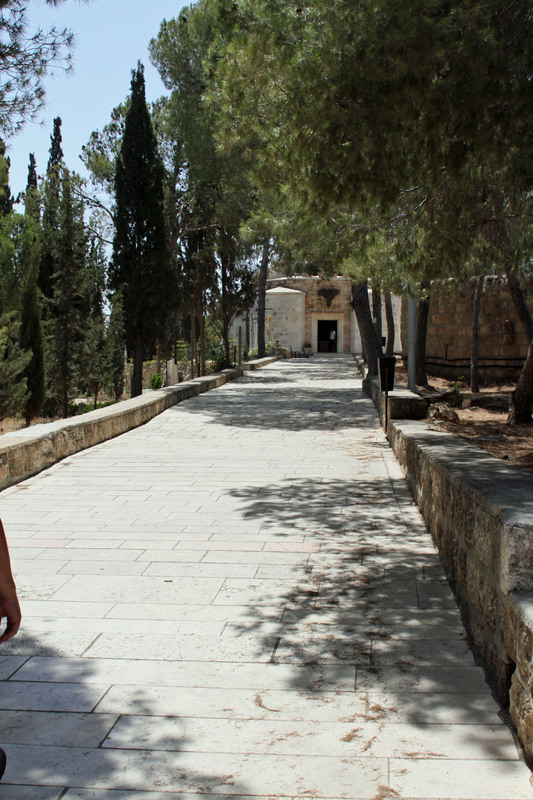 The Church of Transfiguration on Mount Tabor. 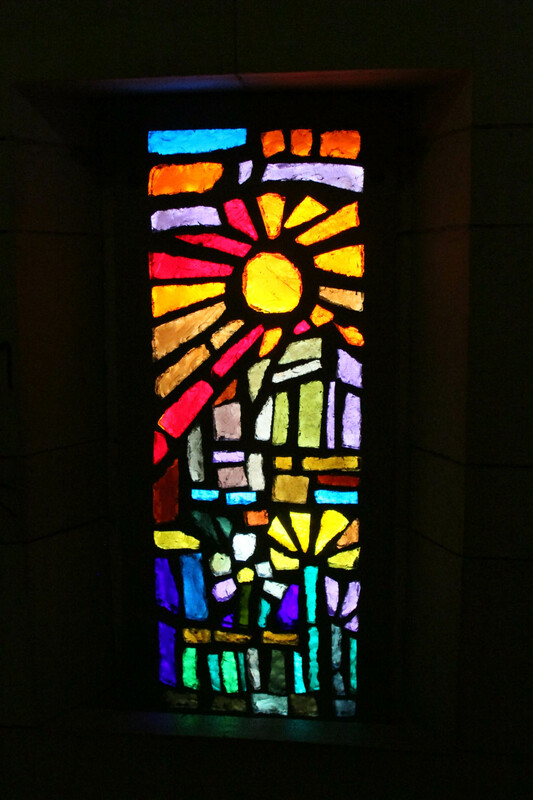 A lovely stain-glassed window in the Church of Annunciation. 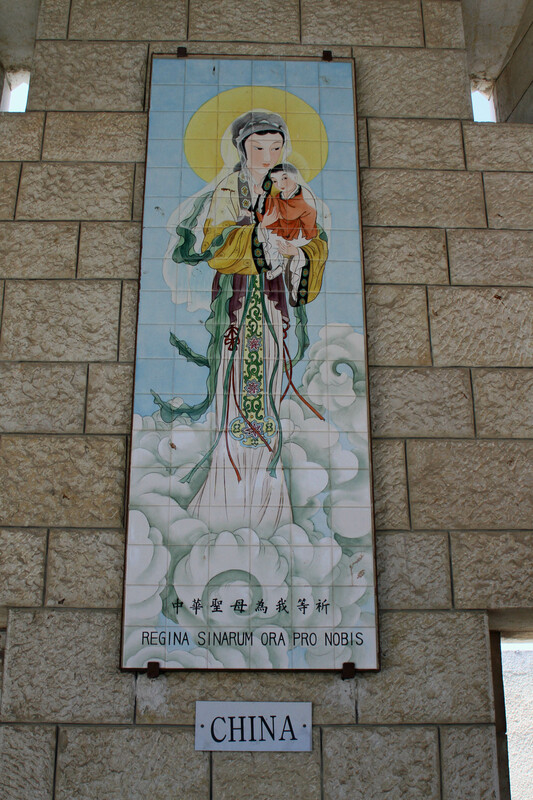 A Mary and Jesus mosaic from China (on the porch wall of the Church of Annunciation in Nazareth). 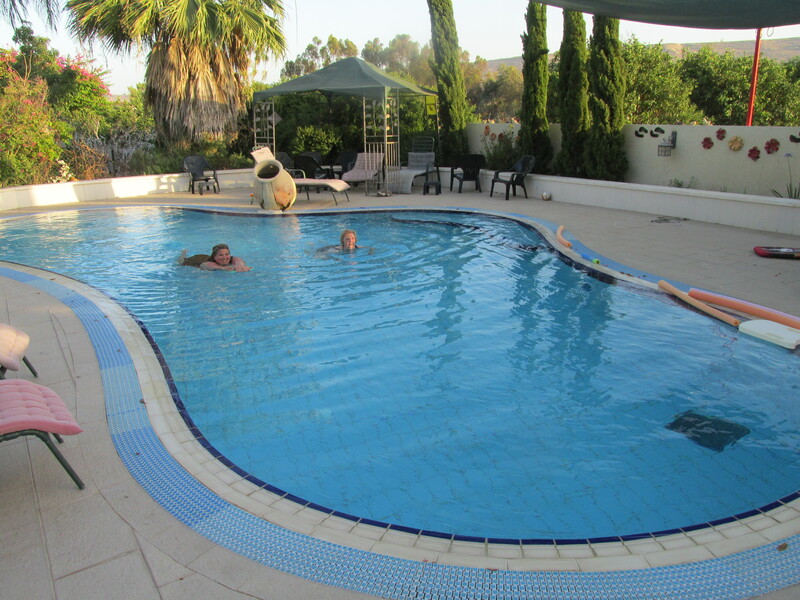 The pool at Arbel Guest House is cute, comforting and refreshing. 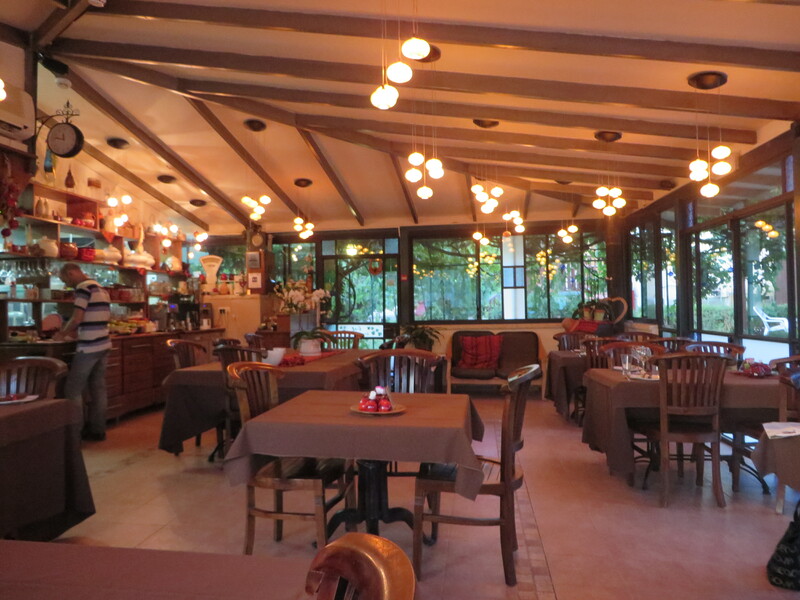 The dining room at Arbel Guest House. Dessert was done in style! Lovin the cool waters after a day of hiking the gospel trails. 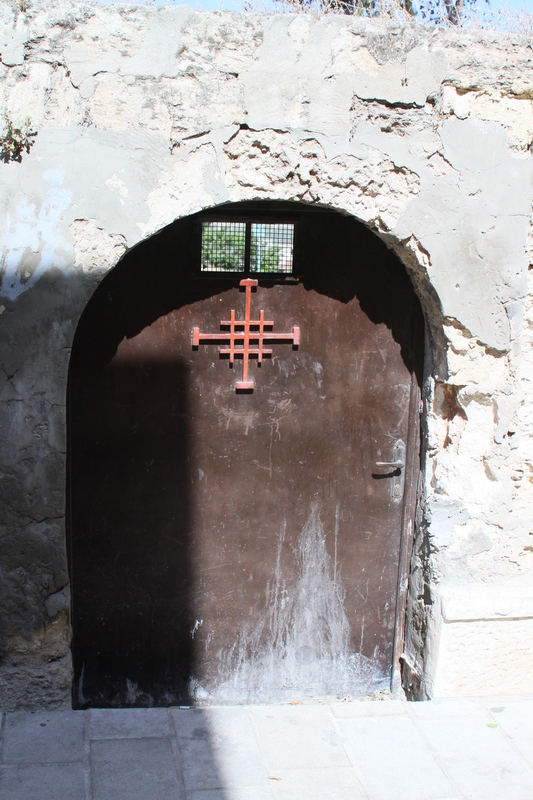 A door at the church in Cana with the Franciscan cross. A short video view of the Jezreel valley from the top of Mount Megiddo. From the uncounted come many of His miracles. 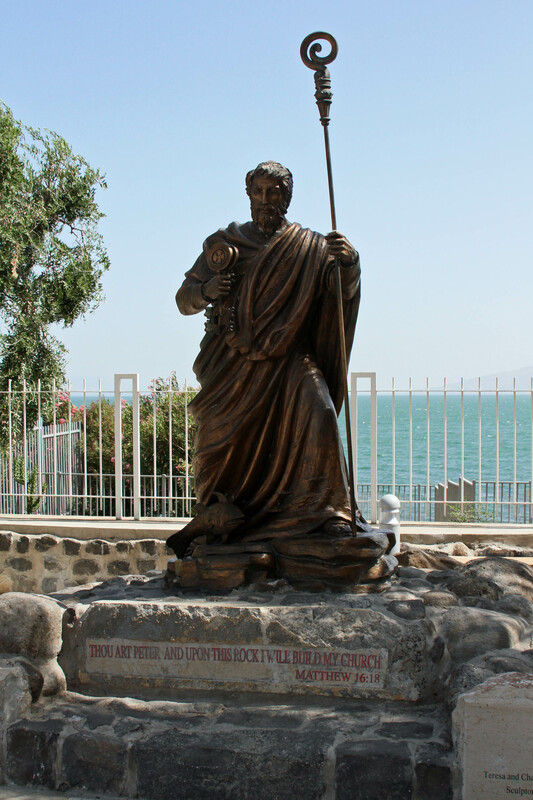 My favorite part of our trip to the Holy Land was the area around the Sea of Galilee. This is the heart of where Jesus and his disciples traveled and it’s also a lovely area. If this was a lake at home there would be million dollar homes and resorts along the shores. Tiberius does rise above the water into the surrounding hills and there are a few resorts, but it seemed so peaceful with farms and churches for the most part. Sea of Galilee at Capernaum. 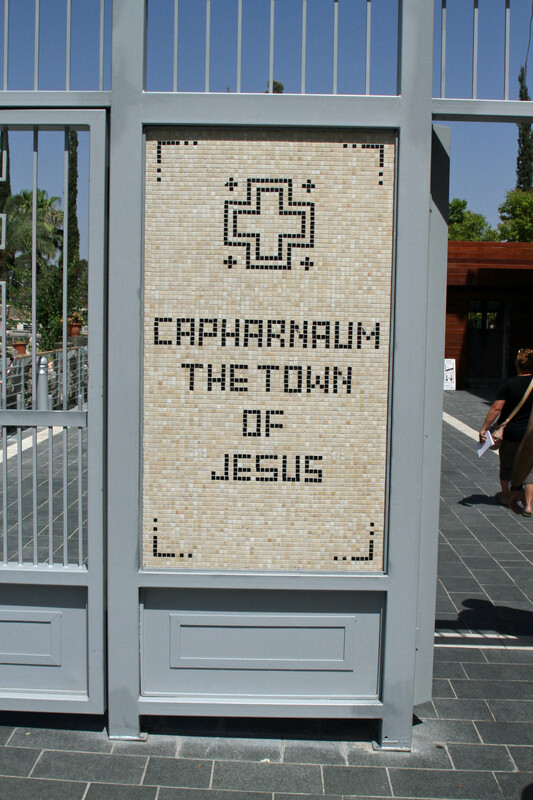 After Kursi (see last post), we continued around the eastern shore toward the North and stopped in Capernaum, the town where Jesus lived and started his teachings. It was here that Peter built a house and where the Byzantines and then the Catholics built churches over ruins. The church there now is quite beautiful. 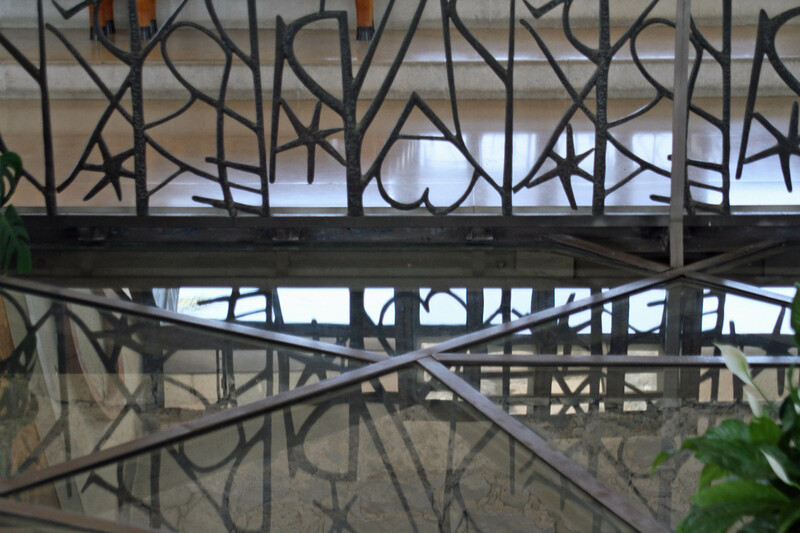 There is a glass floor where you can see the rocks of the ruins of the house below. Jesus told Peter he was to be the rock upon where His church would be built. Peter had issues during the trial of Jesus but he was steadfast in his faith when Jesus was ascending to Heaven and leaving His message in the hands of his friends and disciples. He knew Peter had what it took to stick with his faith through any hardship. He was a rock of faith. The Church had a calming and peaceful ambiance. I was hushed by a monk when explaining a story to my dad—there were no “lessons” allowed inside the church. 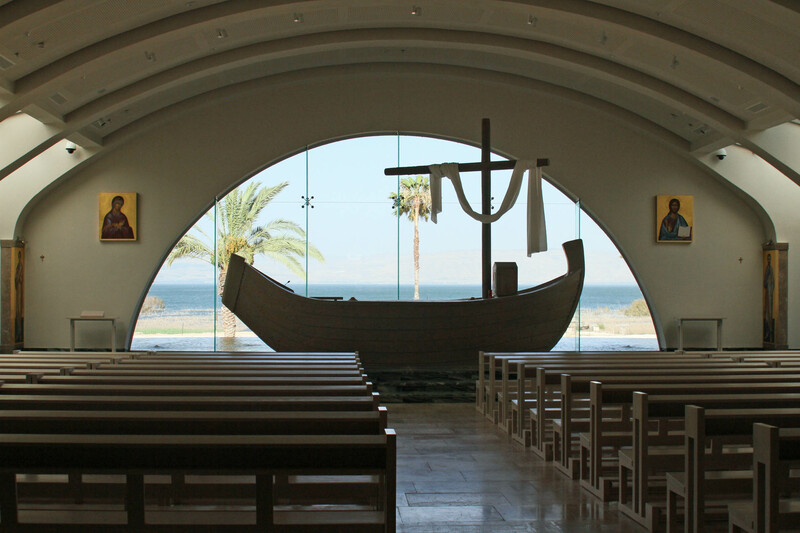 It was a perfect place to meditate with windows that looked out over the Sea of Galilee and the Spirit dwelling within. Outside, we walked around some more ruins of the village and sat by the Sea for a few minutes. The church of the miracle of the multiplication of fish and loaves was our next stop along the Sea. There was a beautiful mosaic in the floor representing the miracle where Jesus fed thousands of people with just a couple of loaves of bread and a few fish. I love this story for several reasons. The first is that recently I heard a sermon from Christine Caine who used this miracle to explain how God uses the uncounted—people who don’t “seem” to matter—to fulfill His miracles. You see, in those days, when crowds or cities were counted (how many people were there), only the men were counted. Women and children were not important enough to count. So when we read that 5,000 were fed, that was only the men—it was more like 10,000 or 20,000 fed if you include the women and children in the audience. So, that day along the shore as Jesus was teaching, some mother packed a small lunch for her son to take with him to hear the sermon. Two people who didn’t “count” were instrumental in the miracle of the multiplication of the fish and loaves. Tagbha, church of fish and loaves. I also love this story because I think God still blesses us in the same way over and over. The more we give of ourselves to others, the more we get back and then His blessing multiplies to others. The Masterpiece Fund, our family’s charity to honor the memory of my brother, Greg Crowe, is based on this principle. We believe that the more that’s given to the charity, the more it earns and the more we can give to people who maybe aren’t counted enough in our world. 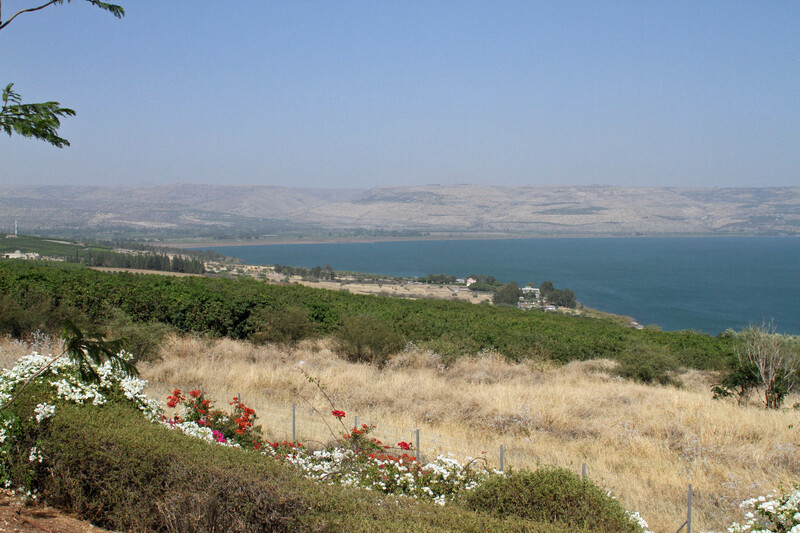 A view of the Sea of Galilee from the Mount of Beatitudes. Back to our trip—from Tagbha we journeyed up the hill to the Mount of Beatitudes—the location where Jesus delivered the Sermon on the Mount. 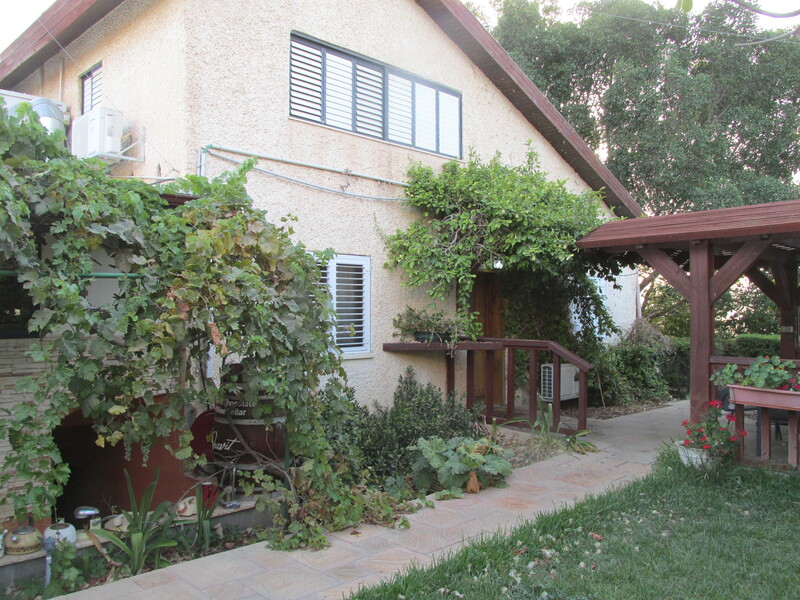 The spot was absolutely lovely—overlooking sloping grassy hills and the wind-blown waters of the Sea of Galilee. The Catholic Church there was very pretty, octagonal in shape with windows looking out on the water and gardens of the church property. I loved this place and we sat and rested peacefully while looking at the boats sailing on the water and the lovely trees and flowers surrounding the property. I could just see Jesus teaching and thousands of people sitting on the hillside listening to His beautiful words. It was a long day but we had one more stop at a quaint and striking church on the shore of the Sea. A young man (an intern) who was a theology student and participating in a mission, guided us around the excavation site and through the church. This place was going to be a resort developed by a reverend where Christians could come on pilgrimages. But as what normally occurs in Israel, the law states you have to excavate land to check on any ancient finds in the land before new construction happens. 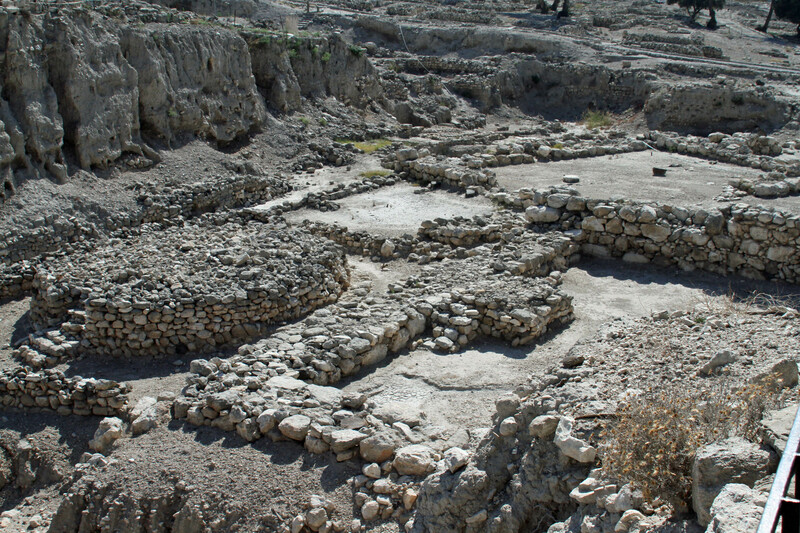 Well, they unearthed an ancient synagogue and little town (the village of Magdala where Mary Magdalene came from). The reverend built a church on the site to honor the women of the bible. 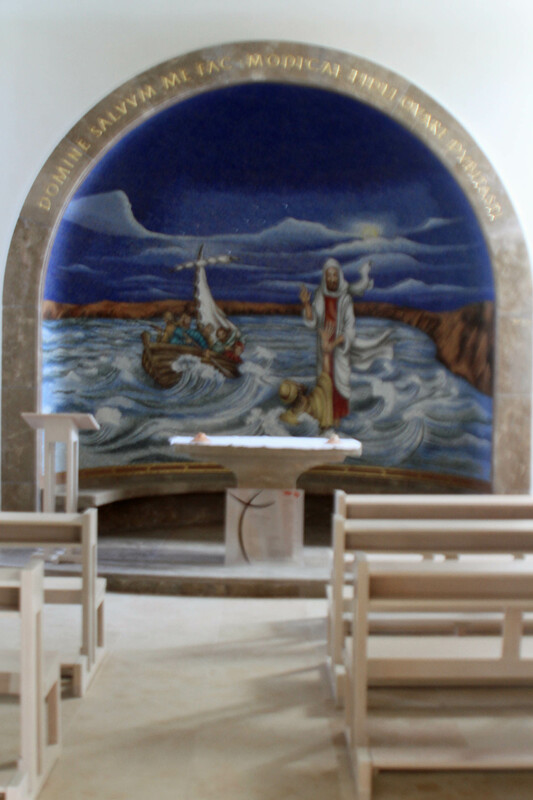 Several small chapels with paintings of various bible scenes surround a central hall that leads into a larger sanctuary with a window that looks out to the Sea. The altar is built into a beautiful boat. This was a treat and the experience of being in this modern church was a fitting end to a day of touring the gospel trail. Our guide took us up around the western side of Tiberius to the Arbel area and a guest house that we called home for two nights. I’ll talk about that more later as it’s worth a great review all on its own. Entrance to Peter’s church where Jesus healed Peter’s mother-in-law. 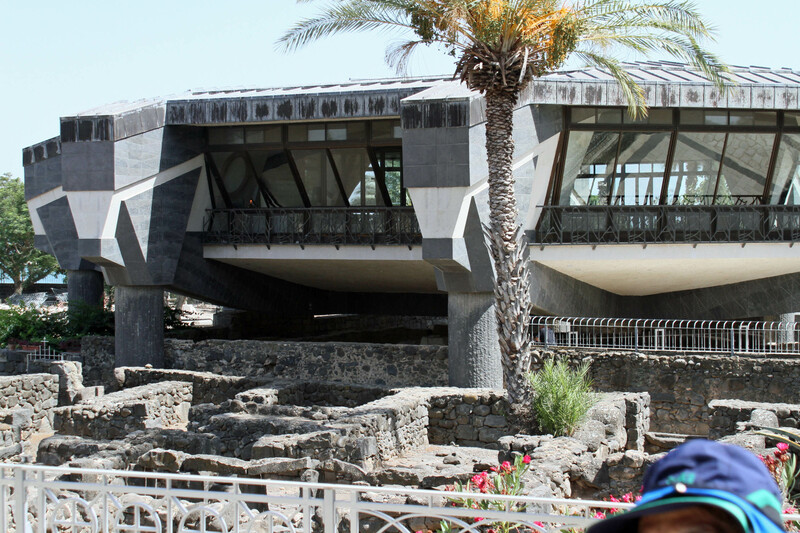 Peter’s church in Capernaum–an octagonal structure built over old ruins. View of the Sea from the Mount of Beatitudes. 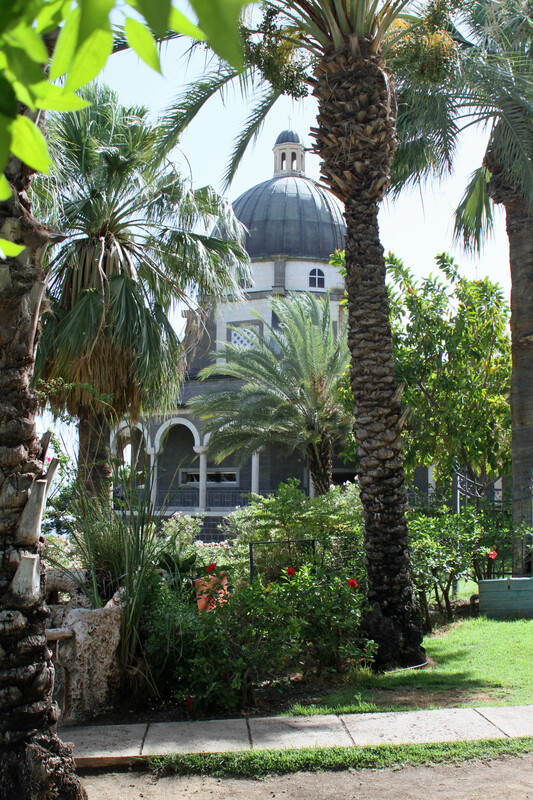 The Catholic church on the Mount of Beatitudes. 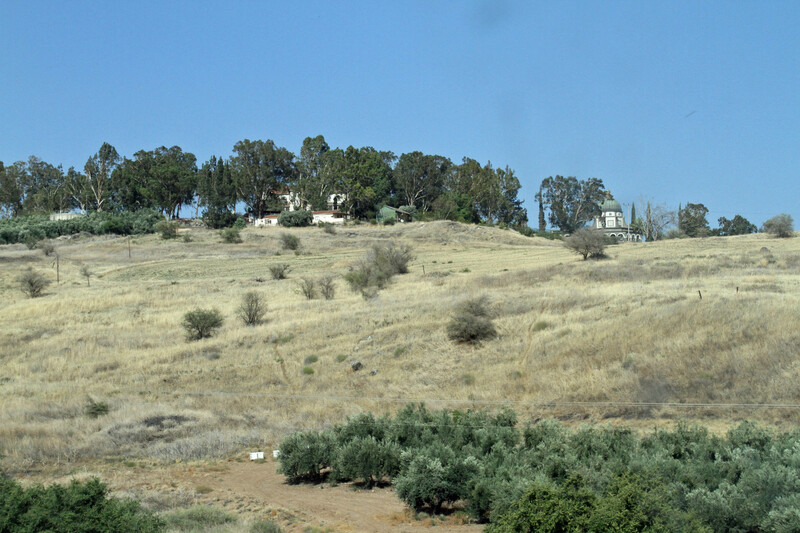 View of the church on the Mount of Beatitudes. Seeing both sides of the Jordan. 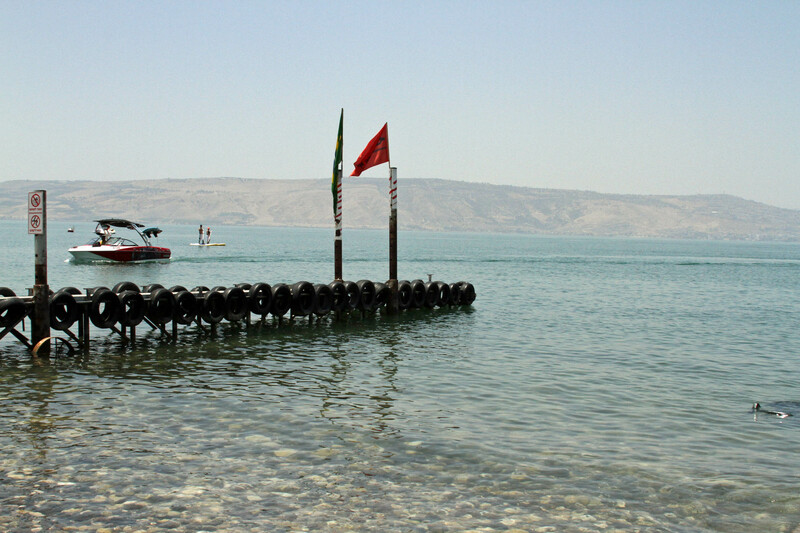 The River Jordan looking over to the Jordanian side with people getting baptized. 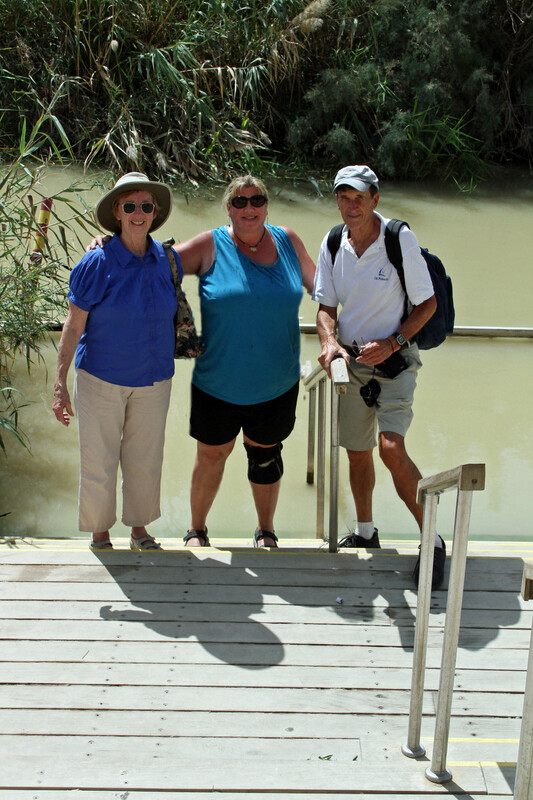 Onward we went on our trek through the Holy Land, from the Dead Sea to an area we consider filled with life. A little back story to start off. Jesus’ name in English is Joshua which means salvation. Fitting name for our savior. We have to have faith to follow Jesus and to trust that He will take care of us. Another Joshua in the bible played a prominent role in our next destination. Joshua and his buddy Caleb were two of a group of the men tasked by Moses to check out the land across the Jordan and report back what they found. Joshua and Caleb were the only ones to give a positive report and to encourage Moses and the Jews to act now and enter the Promised Land as God wanted them to. However, the Jews heard other stories of giants and mass armies and they got scared. The result? Forty years of wandering in the desert until finally, Joshua led the Jews across the Jordan and into Israel. 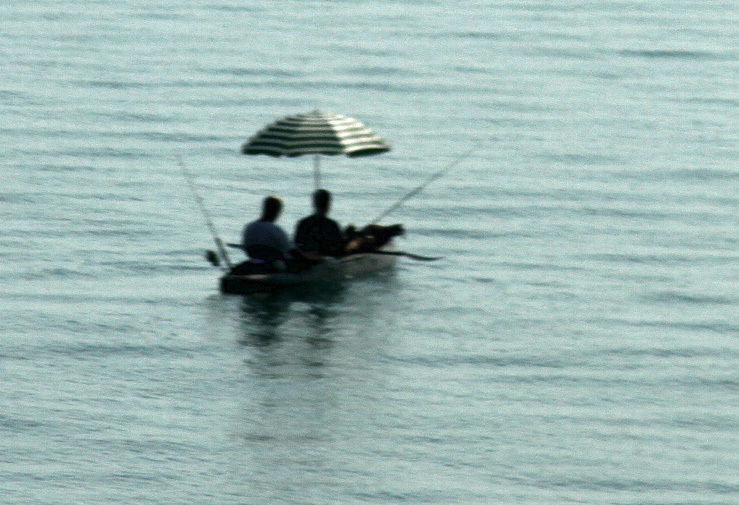 Just two guys hanging out on the Sea of Galilee. At the time of the Jewish crossing, the river was running very fast and flooding. It was scary and dangerous. The Jewish people had to have faith in God that He would take care of them to get them across the river. It wasn’t until the priests took the first few steps into the river as an act of faith that God stopped the flow of water to allow the people to cross safely. Everything in the bible flows together perfectly. It makes sense that this river, the place where the Joshua led his people to the Promised Land, would be the place Jesus was baptized. 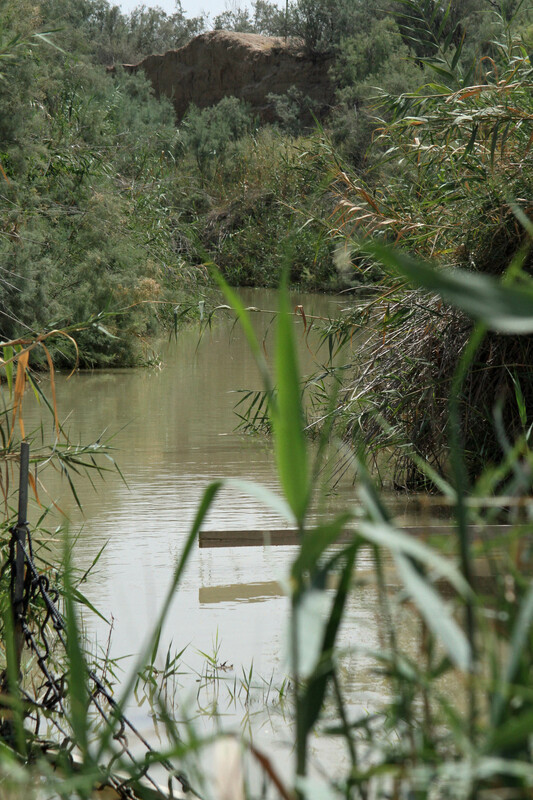 A view of the Jordan River from the Jordanian side in 2007. The Israel area was not tourist friendly back then. As we drove up through the West Bank, we entered an area that had fencing on both sides of the road. Beyond the fence were mines (or maybe used to be mines) from the days when it was a no-man’s land. As we got close to our destination, my parents and I realized we had been there before—just on the OTHER side of the river. 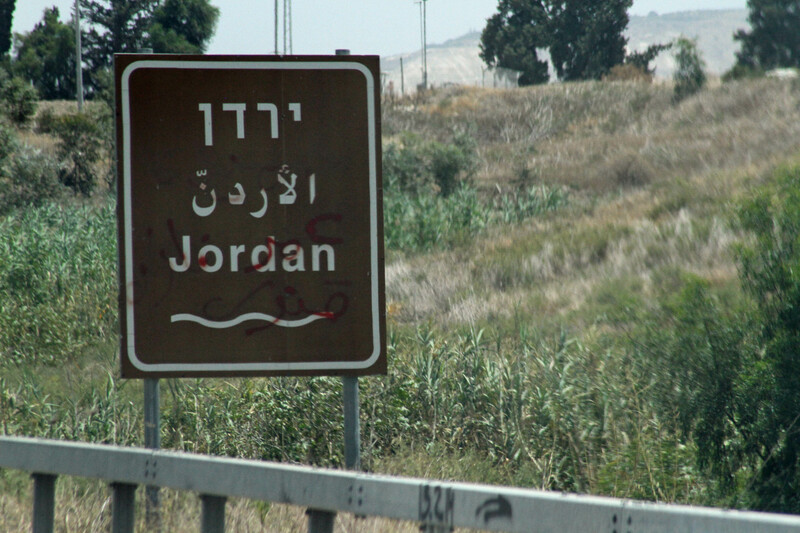 Wow, it was something special to see the place we had visited while touring Jordan back in 2007. 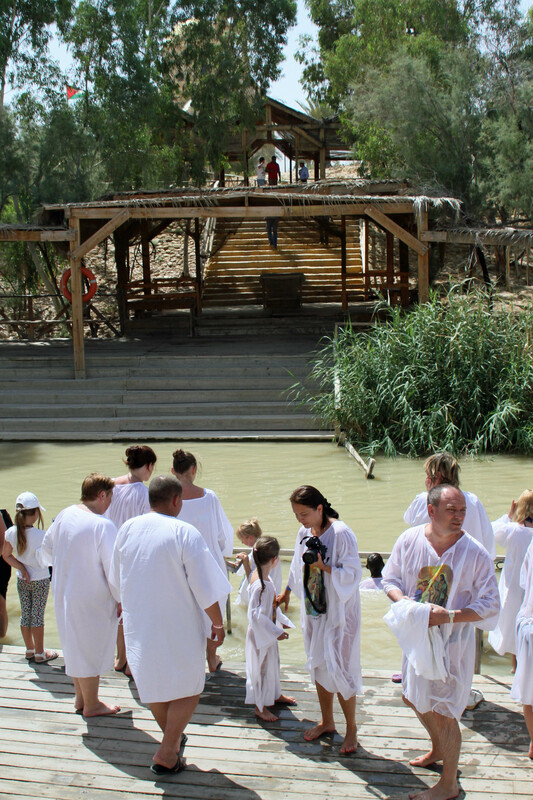 Back then, the Israel side was not used as a tourist destination, but now, there were groups of people in long white shirts walking into the water to be baptized. We could see the steps where we waded into the eastern shore of this very narrow river seven years ago. This time, we were able to step in on the Israeli side. I think most people visiting the river Jordan would be surprised at how narrow and small it is. It’s very calm, and has a greenish/brown color with a lot of vegetation along the banks. It would be very easy for someone to cross over the border here—and in fact there was at least one crossing years ago. 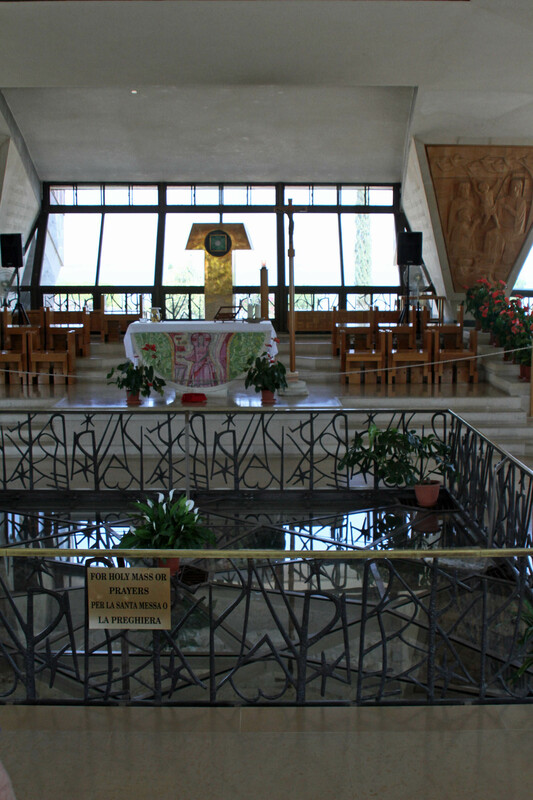 On the Jordanian side there is a baptismal altar that showed up there very suddenly one year when the Pope visited. Funny thing, it used to be on the Jewish side. Sea of Galillee. The water was crystal clear. 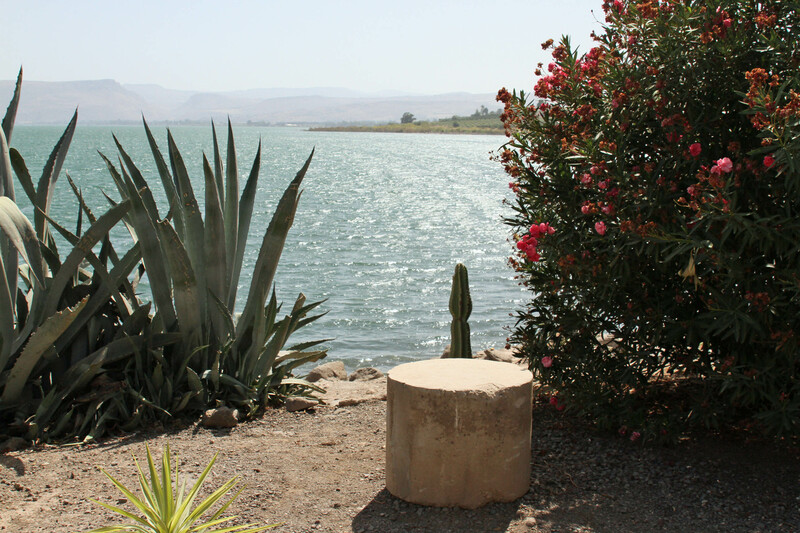 We continued North past Jericho and through the west bank to the shores of the Sea of Galilee. We could tell why some of the fishermen of Jesus’ time had issues—the wind comes down over the mountains and blows nicely across this beautiful body of water. White caps could be seen out on the water but as we stopped at a Kibbutz for a dip in this water, it was calm and clear as clean glass. The bottom was rocky with lots of little stones, and the surrounding countryside was filled with flowers and banana tree farms. 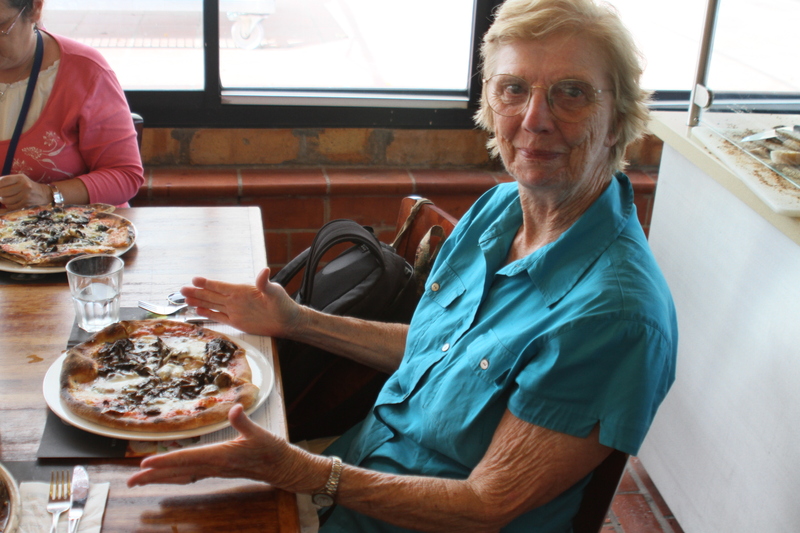 We had a wonderful lunch at the Fish and Bistro Restaurant in Ein Gev. The ambiance was lovely, the service was good, and the fish was absolutely delicious. I highly recommend a stop there—our guide was on the mark with this selection. Israel’s jibe at an old Syrian leader. 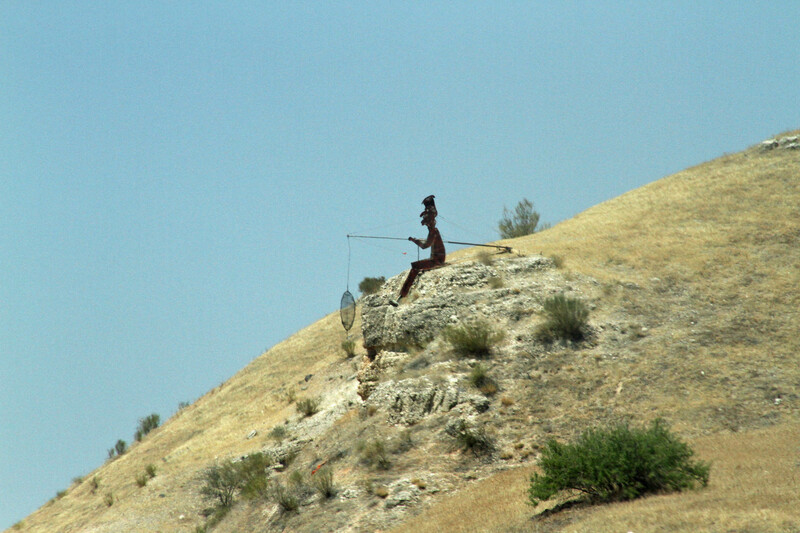 After lunch we got back on the road and saw a black steel silhouette of a man sitting on the side of the hill with a fishing pole. This is a Jewish joke. I guess if you’re Israeli you have the right to make this kind of bold insult, but I think they went considerably out of their way to poke fun at a deceased Syrian leader who had promised that he would be fishing off the shore of Galilee near the Golan Heights before he died. He did not accomplish his desire and so a monument stands to his failure. Mosaic floor in the ruins of the Byzantine church. Our next stop was at Kursi, the location of a miracle of Jesus. This is where Jesus met a man who was possessed by demons (so many that they identified themselves as Legion). Jesus healed this man and allowed the demons to enter into a herd of swine that was grazing in the area. The possessed pigs ran down the hill and into the sea where they drowned. 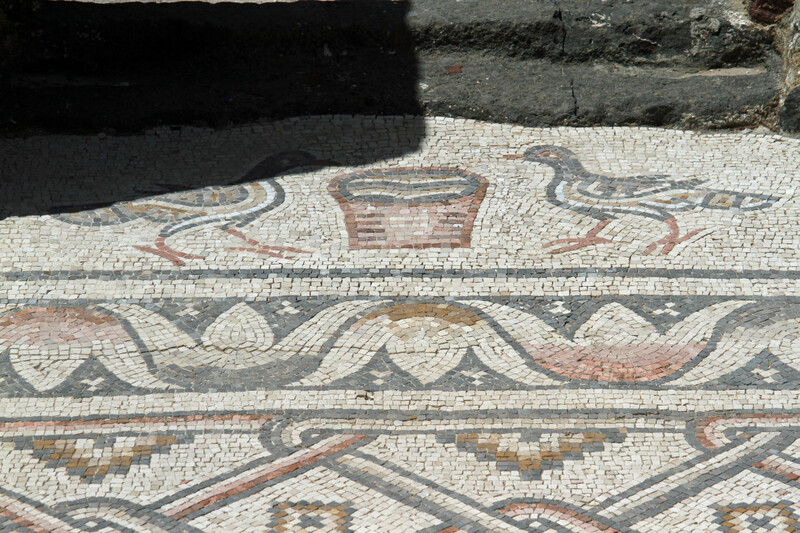 The site of Kursi hosts the ruins of a byzantine church that had a beautiful mosaic floor courtyard surrounded by pillars with pictures of animals. It was pretty hot that day so we continued on around the Sea to more Christian sites. I’ll talk about those in the next post. Mom and Dad and I on the banks of the River Jordan. Here, the Jordan is calm and narrow. Signage is always in three languages in Israel. 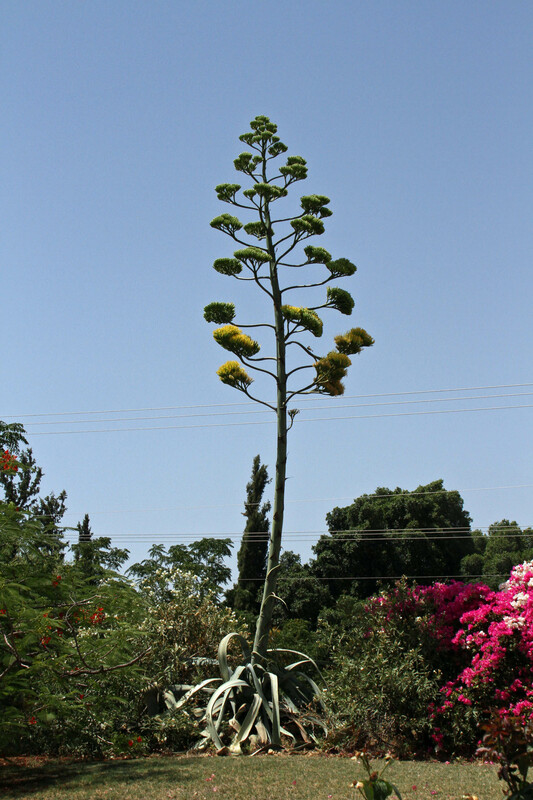 An interesting Dr. Seuss-type tree grows in Kursi. 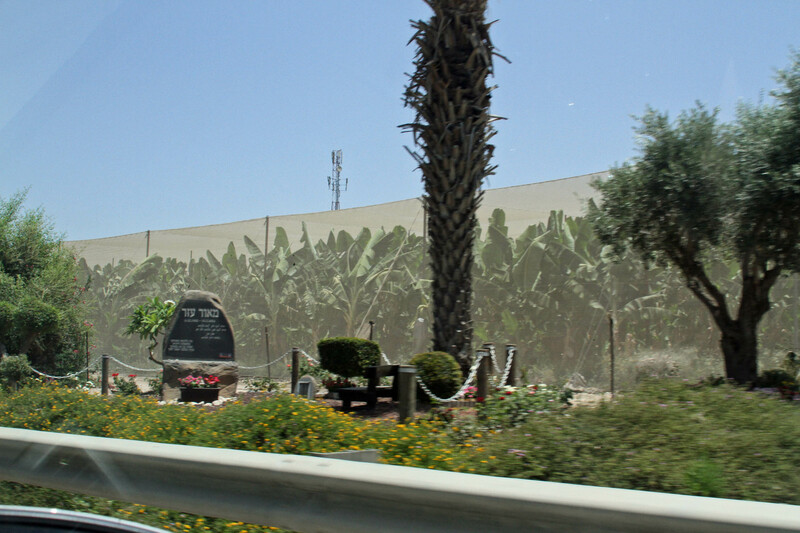 Lots of banana farms surround the Sea of Galilee. They are covered by some kind of mesh. 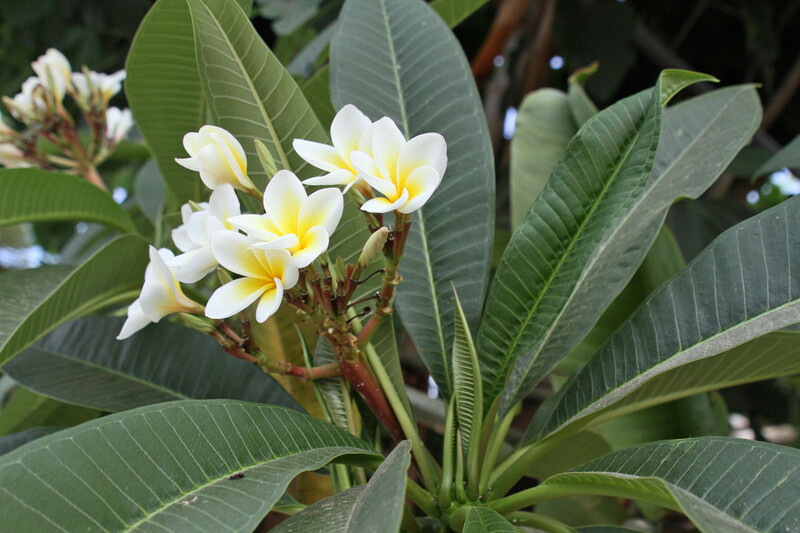 Flowers bloom in the area around Galilee. 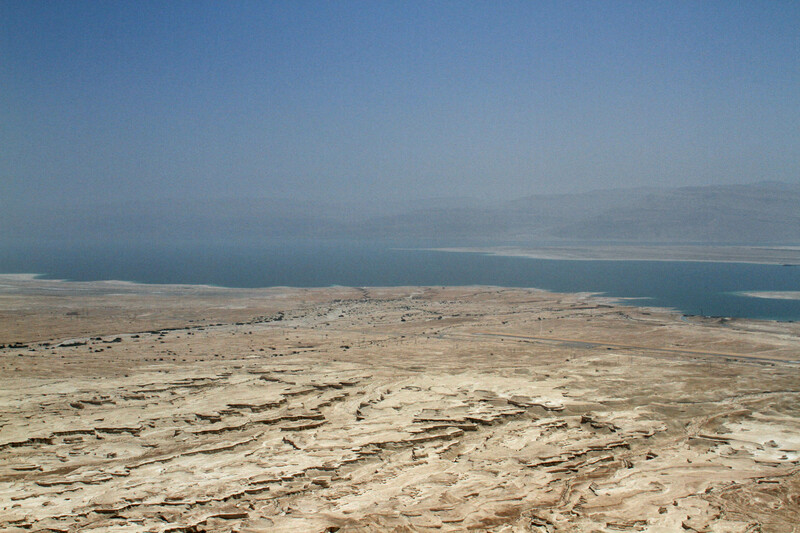 From the heights of Masada to the depths of the Dead Sea. Our trip through the holy land continued with a ride through the Negev (desert) on our way to the area of the Dead Sea. Our guide started off the day telling us we couldn’t go to Masada due to the heat (it would eventually make it up to 44 degrees Celsius, or 111 Fahrenheit, but it was not there yet and I’ve been through worse in D.C.). After being a little miffed at her for what I considered to be unprofessional behavior for a tour guide, we politely insisted on going, seeing how the trip was expensive and we wouldn’t likely be getting to Israel again and Masada is one of those sites we definitely wanted to see. 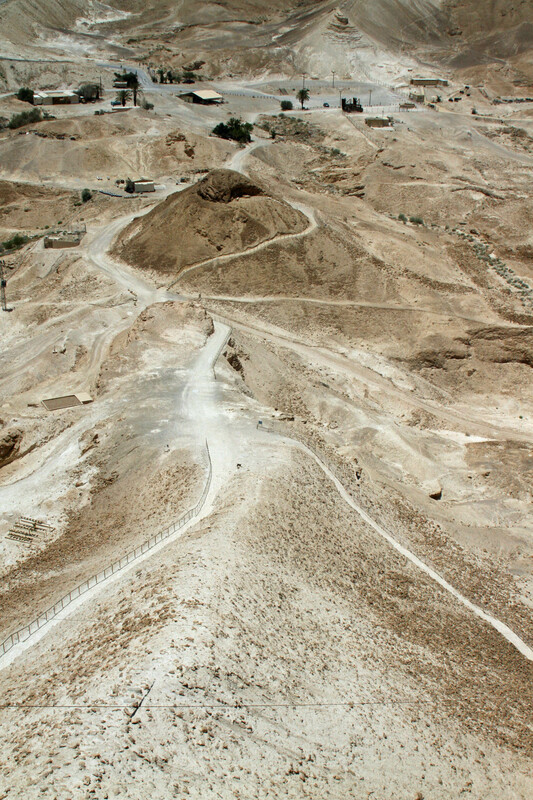 The Snake Path up the side of Masada. I had known the tale of Masada from one of my small group studies. We watched a video by teacher and historian, Ray Vander Laan, whose ministry is focused on understanding the Bible in light of the historical and cultural context in which God placed it. I highly recommend these video lessons. In addition, before I arrived in Israel I had just finished reading an excellent book titled The Dovekeepers, an historical fiction based on several women who were at Masada at the time of the massacre. 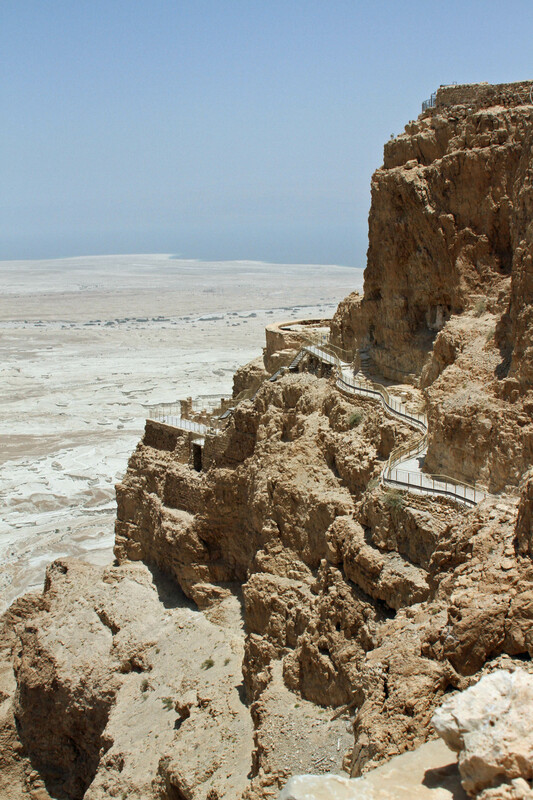 A view of Masada, the palace was spread across several layers. The path to the water cisterns can be seen along the side. 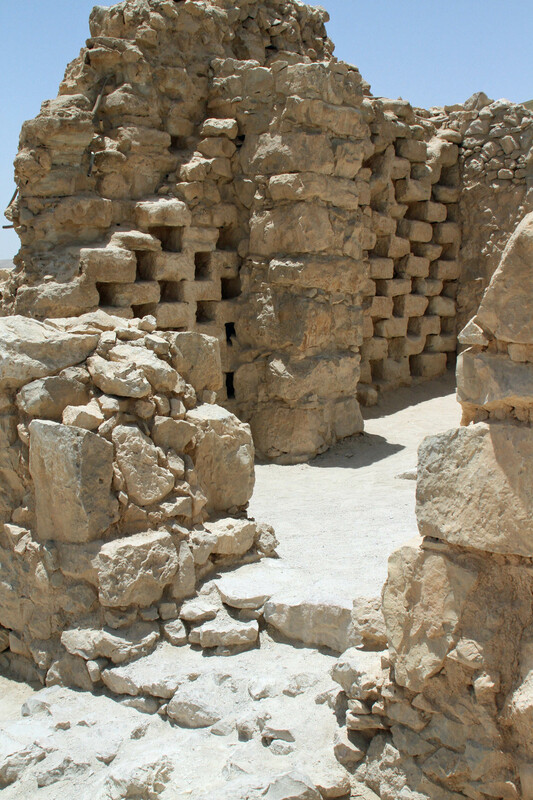 Masada was a fortress palace built by the crazy and paranoid King Herod. It’s in the middle of nowhere overlooking the Dead Sea. In ancient times, the only way to get to the compound was via the snake path, a narrow, windy path that snaked up the mountainside. Anyone climbing the mountainside could be viewed for many miles by the guards (and killed if you were an invader). An extensive and brilliant water system allowed anyone living in the compound to have access to plenty of water to survive for a long time. Huge cisterns and long storage buildings provided enough food and water to sustain the inhabitants through many months of siege. And that is precisely what happened around the year 74 AD. A group of Jewish zealots who wanted to live a life away from the big cities and out of the control of Rome established a compound at the vacated mountain top of Masada. The Romans could not abide anyone rebelling against them, even a small group of unimportant people in the middle of nowhere. They camped out along the dessert at the base of the mountain and laid siege. Waiting the Jews out was not enough, so the Romans got their slaves to start building a ramp. Many lives were lost, but finally the ramp was wide and high enough for the Roman soldiers to break through the walls and invade. While they were planning the final invasion, the Jews decided they would rather die than be enslaved, so 10 men were appointed to make their way through the compound killing their friends, families and neighbors. All but a handful of the Jews were dead when the Romans came through the walls. 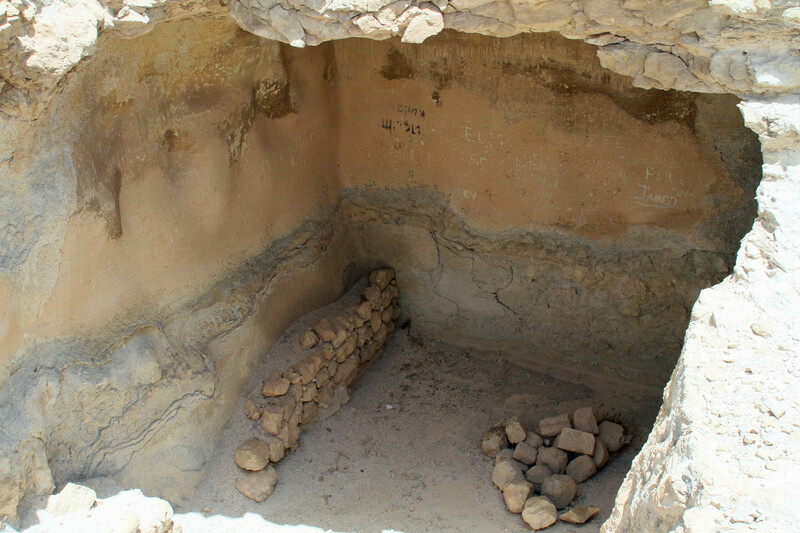 Ruins of the storage rooms. There were many obstacles for invaders to get through before reaching the palace. Herod was a paranoid freak. In the near 100 degree heat, we hopped on a gondola and zipped up to the top in no time. We stopped in shade to hear lessons from our guide and saw the palace baths, store houses, guard posts, dovecot (where they kept the doves who helped fertilize the orchards and were used for sacrifices), cisterns, mikvehs (cleansing baths), and the ramp the Romans built. It was totally worth the trip, the heat wasn’t that bad, and the views of the Dead Sea and down the mountainside were beautiful. After an easy ride down the mountain, we enjoyed some more Shawarma in the cafeteria before heading out to visit Ein Gedi, a lovely park where we walked along a path lined with Christ’s Thorn Jujube (the crown of thorns was made from branches of this tree) to a waterfall. It was so hot, we took off our shoes to wade in a bit before walking back and viewing all the caves—one of which may have been where David cut King Saul’s robe. 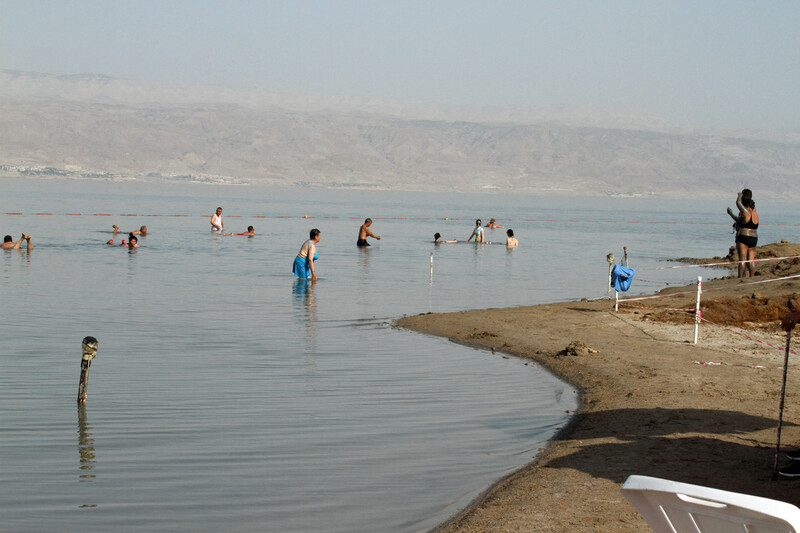 Our final stop of the day was a beach along the shores of the Dead Sea. The Sea has been evaporating a lot over the years, as was evident in the large distances from the current shore line to where it used to be. This body of water is famous for a number of reasons, mostly due to its chemical makeup and the fact it’s the lowest place on earth. 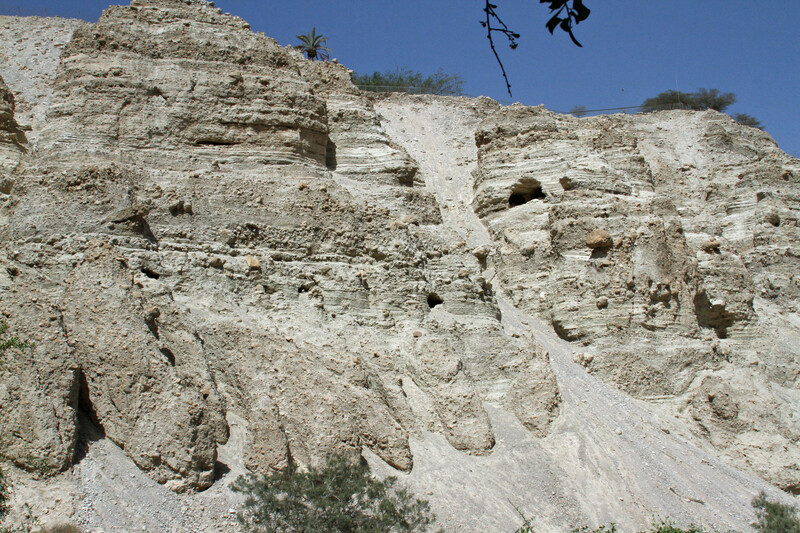 It was formed by tectonic shifts near Haifa that created springs. These springs overflowed into the Jezreel valley and throughout the lands. All the minerals from the land were mixed into the water. The salt concentration is so thick that we had to be very careful not to touch our eyes. That old saying, don’t throw salt into the wound was never so relevant as I could feel the sting in every tiny cut in my fingers and toes. Mom and I lathered on some of the mud on the shore and floated for a few minutes. Our skin felt great but there was no swimming (just careful floating because of the buoyancy of the water) and it was so hot that we didn’t spend too much time in the water. It’s a nice experience to have and now I can say I did it. But it’s not the kind of thing you relish doing again. Upon existing the water, we delighted in the cold showers located on the beach. 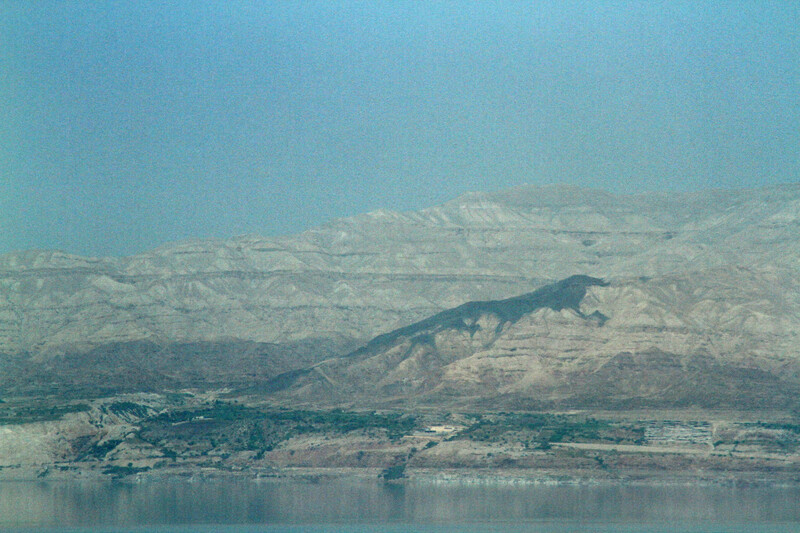 Looking across the Dead Sea to Jordan. An interesting shape in the mountainside. It was interesting to look across at this large Sea all day and not see any boats or people or activity. 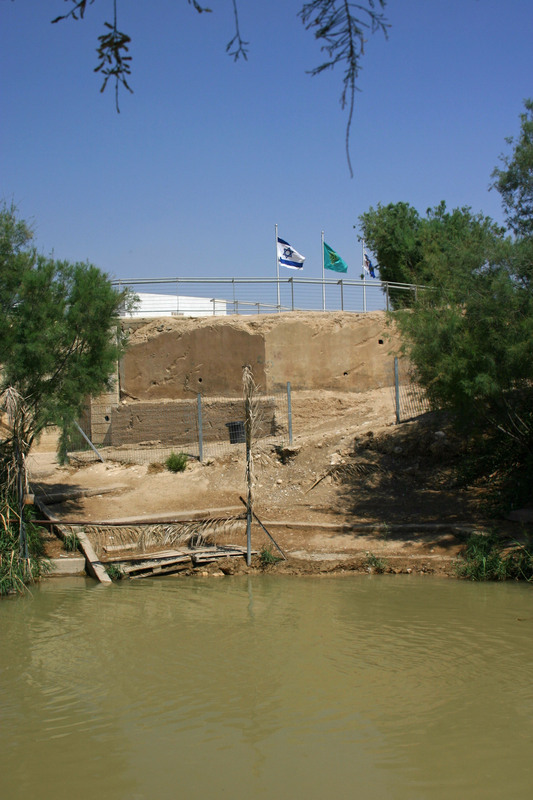 In addition to the salt destroying boats that would try to sail, it is also the border between Israel and Jordan. So not so good to be risking a crossing like that. 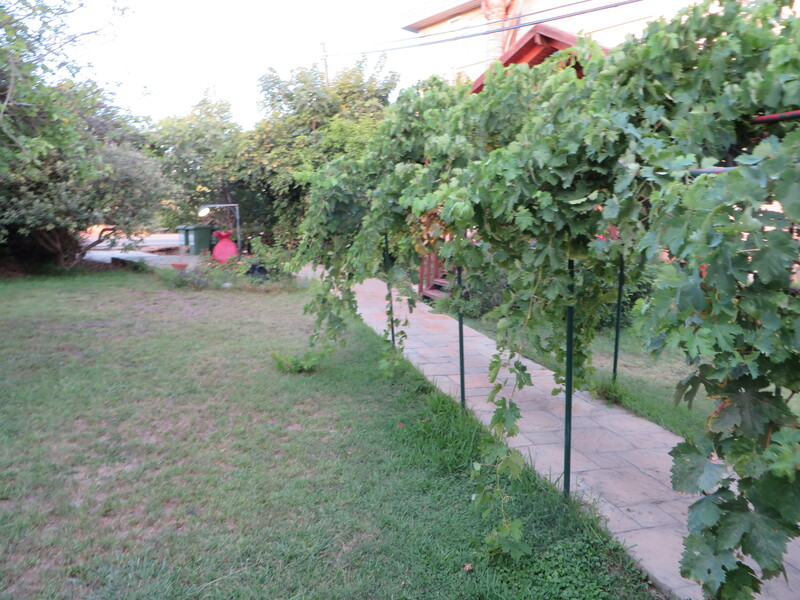 That night we stayed at a Kibbutz, a type of farming commune that was popular in Israel for a time. Many still exist in various types of forms. 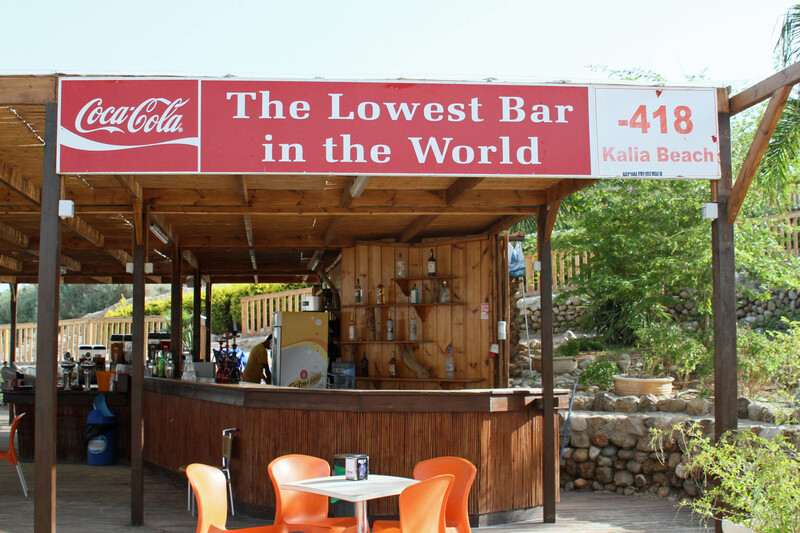 I was not impressed by this one—the Kalia Hotel. The pool closed early so we didn’t have time to enjoy that on this very hot day (kind of weird considering guests are usually touring during the day). There was a mix up about dinner (they didn’t serve it other than on Fridays and holidays) so we missed that and were treated rudely by the diva at the registration counter. So two thumbs down on that place. 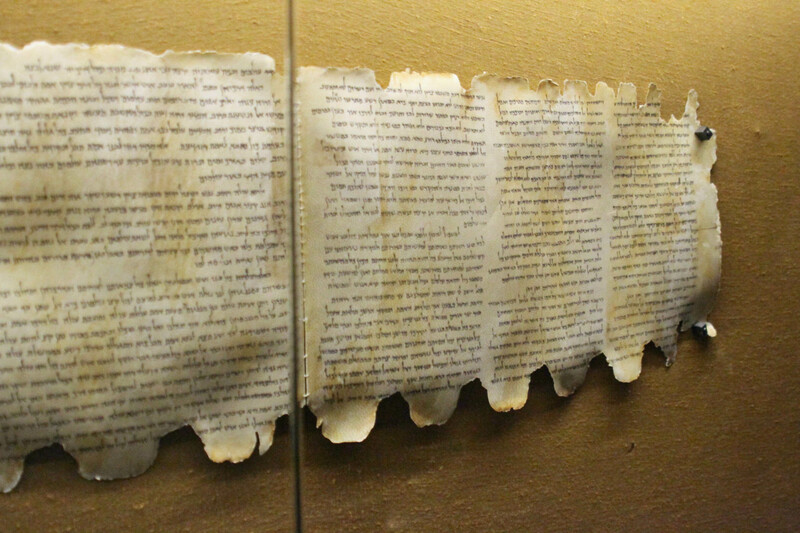 A portion of the Dead Sea scrolls at Qumran. In the morning, we visited Qumran, the site where the Dead Sea Scrolls were found. Many years ago, a young Shepard boy was trying to get his goat to come out of a small cave when he discovered the jars left behind by members of the commune that lived there thousands of years ago. He told his father who told the local Sheik who sold them for a pretty penny. The area is very barren and is about a four day walk from Jerusalem. We learned more about how these desert dwellers survived using large water cisterns and planting date trees that sustained them in many ways. They prayed and wrote down spiritual stories in their scrolls, which they stored in air tight jars in caves to keep them safe. All in all, the heat and desolation of this dessert area made me very grateful for our modern comforts—praise God for air conditioning and cars! 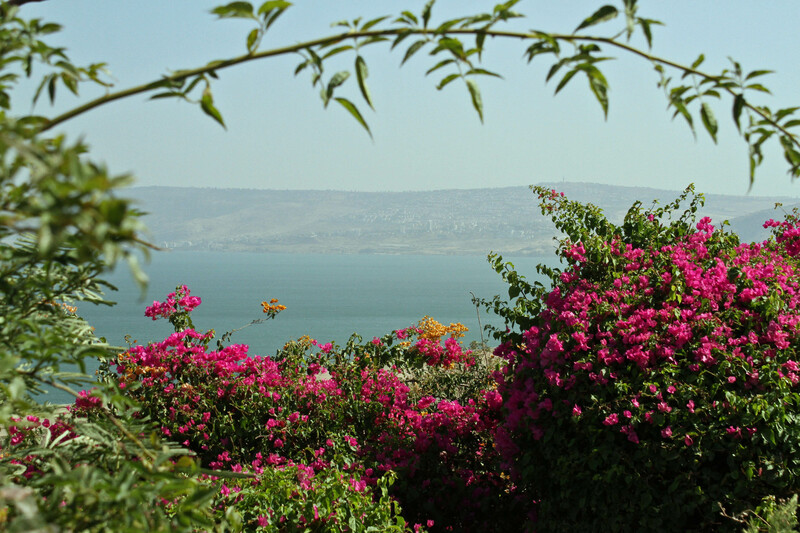 Next stop—our drive through the West Bank to the beauty of the Sea of Galilee. View this clip from Ray Vander Lann’s series about the Dead Sea scrolls at http://www.rvl-on.com/clips/the-dead-sea-scrolls/. 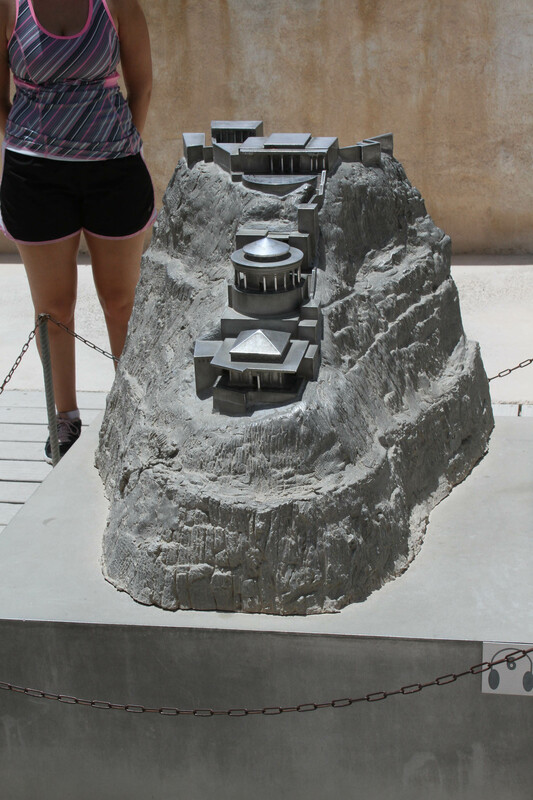 A replica of what the palace at Masada looked like thousands of years ago. 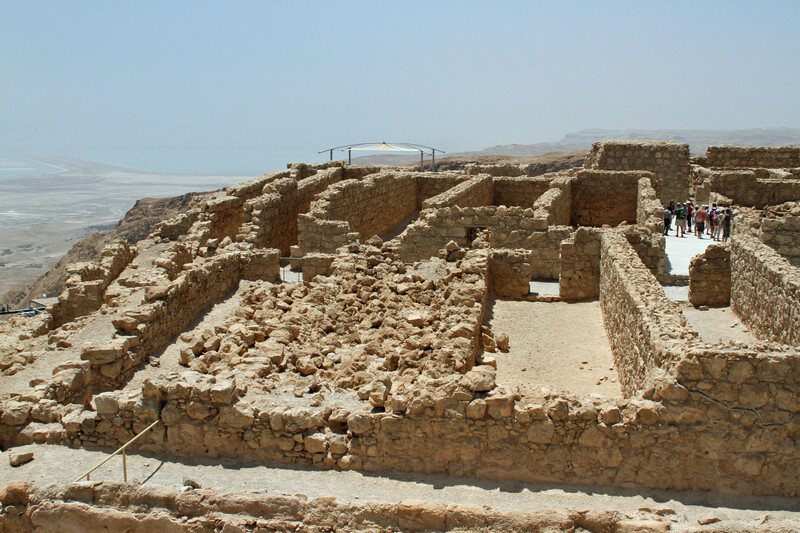 Excavations of the baths in the palace at Masada. You can see the steam pipes in the walls. 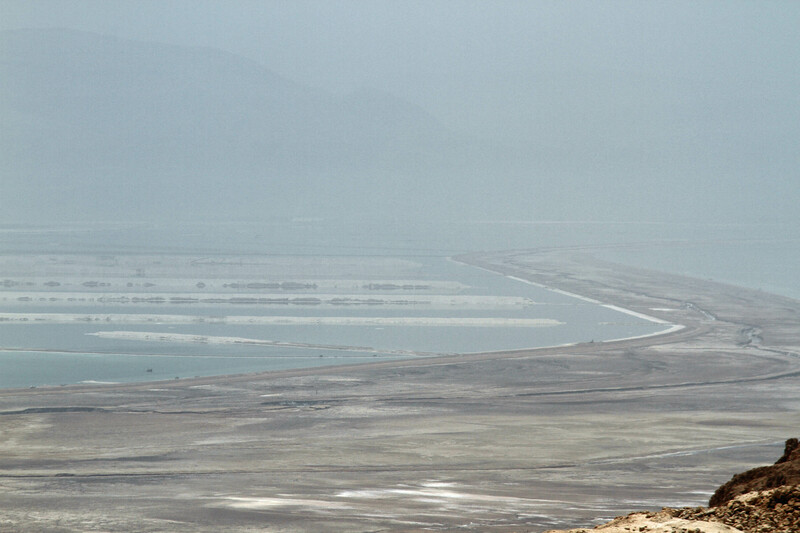 A view of the Dead Sea from Masada. 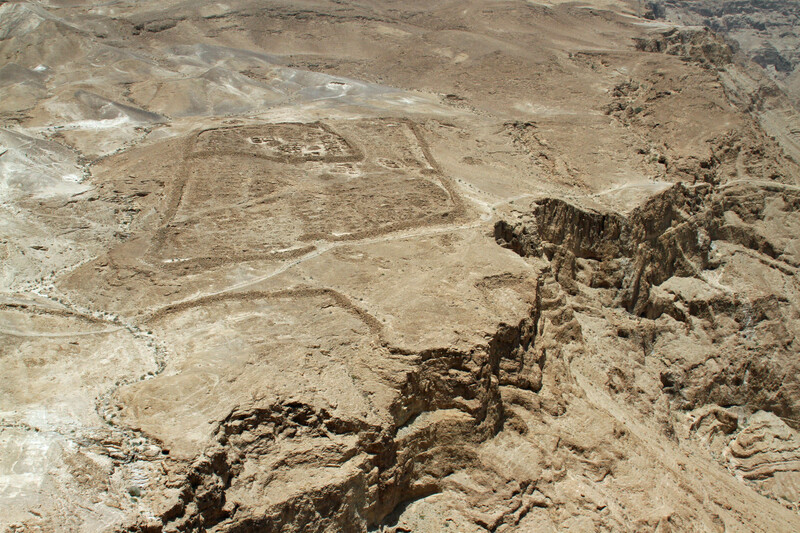 An outline of one of the Roman encampments below Masada. Looking down at the massive ramp built up by the Romans at Masada. One of the massive cisterns at Masada. 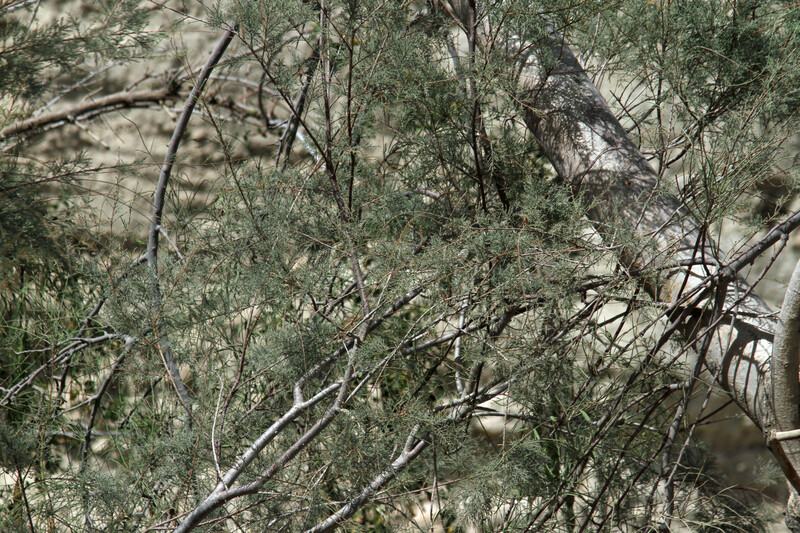 The Christ Thorn tree at Ein Gedi. A view of the salt works (where they collect the salt) at the southern end of the Dead Sea. 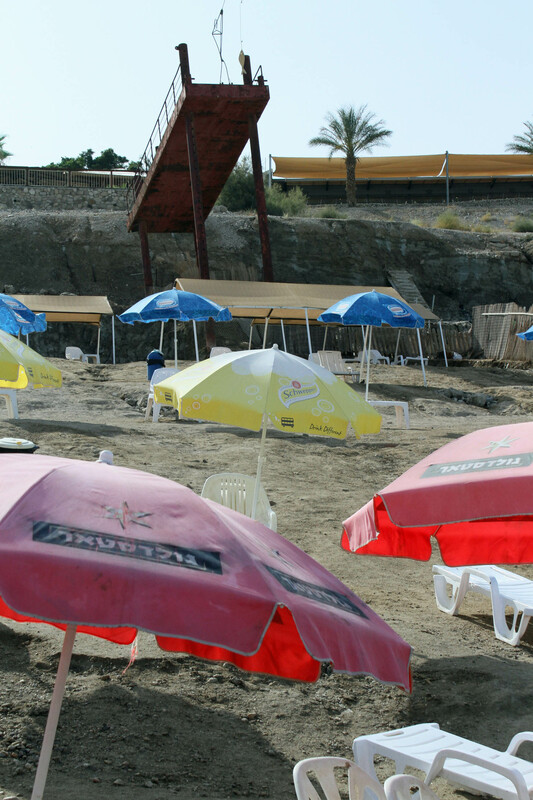 A bar at the beach along the Dead Sea. You can see how much the Dead Sea is evaporating by looking at the docks and resorts along the previous shoreline. 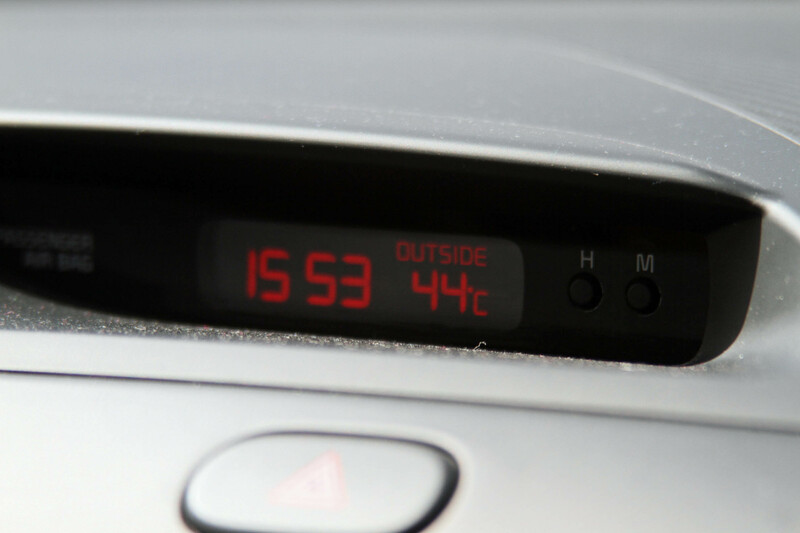 Evidence of the super hot day in the Negev of Israel. Oh little town of Bethlehem. 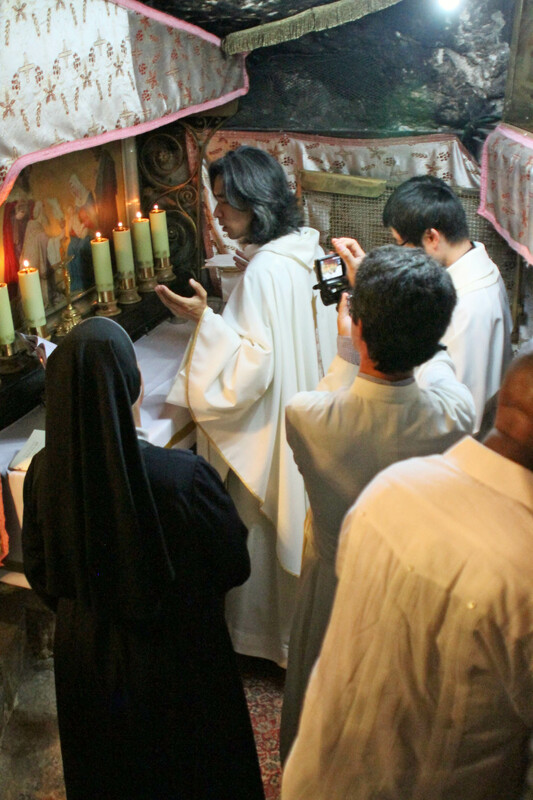 During our trip to the holy land, as our Jewish guide rested on the Sabbath, we took in a tour to Bethlehem. 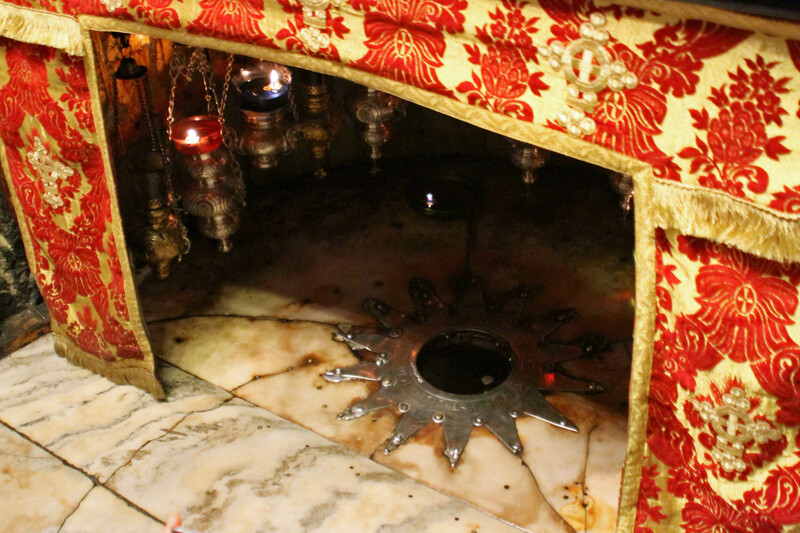 This little town, the birthplace of Jesus, is only a few miles from Jerusalem. 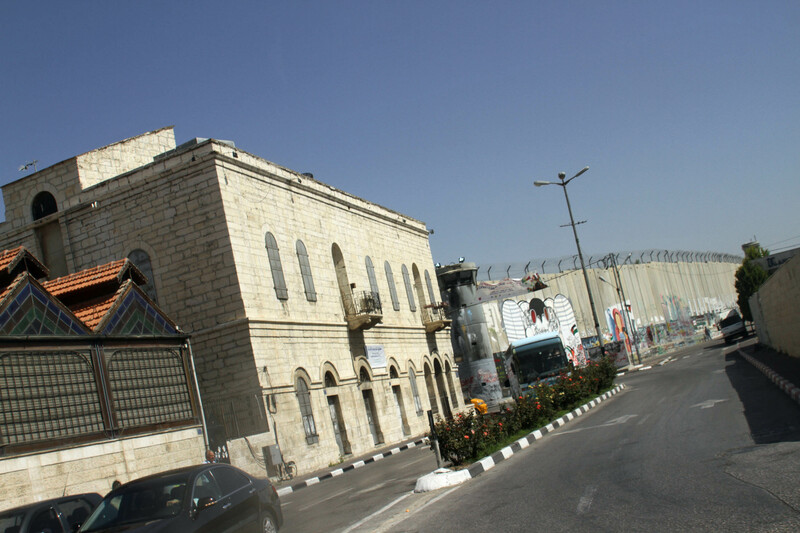 A massive wall with barbed wire separates the inhabitants of Bethlehem and Jerusalem. We were quite shocked to find a massive concrete wall with barbed wire on top lining the border between Jerusalem and Bethlehem. Our guide George, who spoke several languages, including clear and fluent English, told us that back in the year 2000, some terrorists were coming into Jerusalem and attacking people. So, a wall was erected and the Arabs living in Bethlehem stay on their side and the Jews stay on theirs. It has cut down on the violence but as we passed through the security area, it was sad to think it had to be put up in the first place. 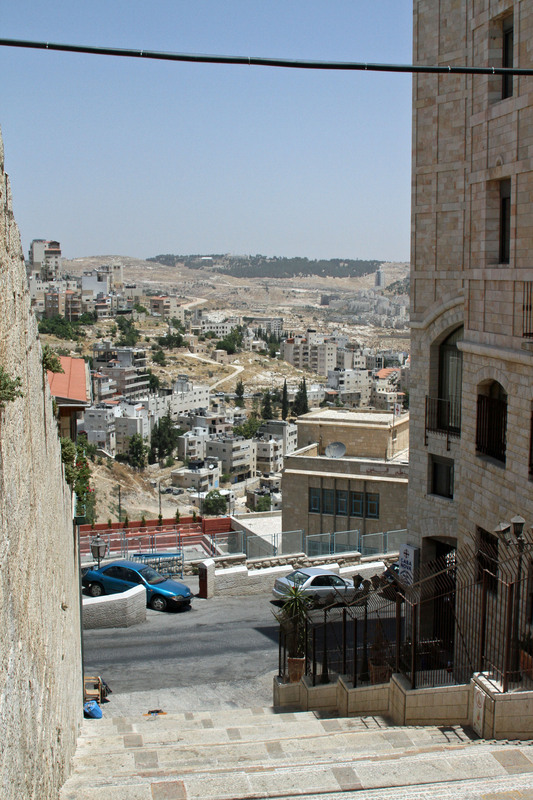 A view of Bethlehem and the hills beyond. A large percentage of the very small Christian population (many are Arab Christians) are concentrated in Bethlehem. I’m not sure if George was a Christian or not but he was well versed in our faith, quoting the bible with accuracy, and we found it pleasing to hear someone who spoke of Jesus and the holy family with excitement and knowledge of the faith. A section of the Milk Grotto. The bus took us along Manger Avenue and up a steep hill to our first stop, the Milk Grotto. 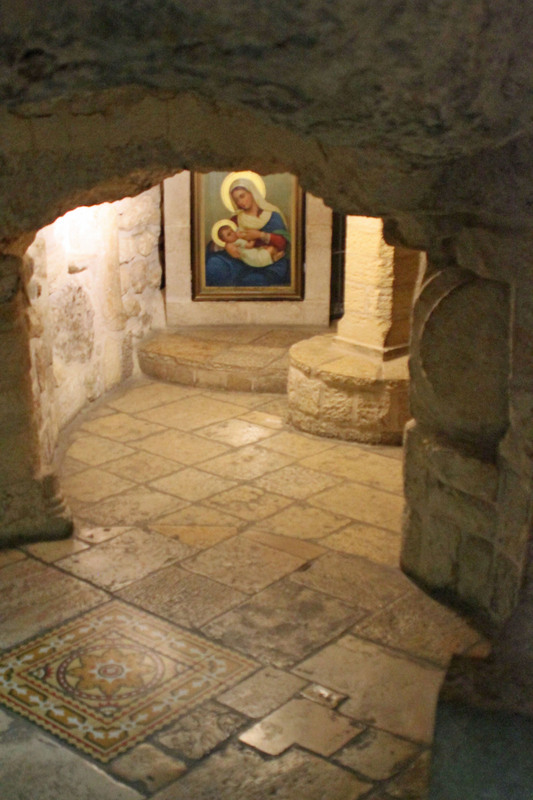 As the holy family was escaping the town to get away from Herod’s soldiers who were ordered to kill all the baby boys, they stopped at this grotto so Mary could feed Jesus. Of course now it’s a church that is built in and above the cave. It was quite peaceful and simple there. It is said that a drop of Mary’s milk fell upon the stone and it turned white. The white chalky substance is now collected and sold—mostly to women who are trying to conceive or who are pregnant. Our guide very wisely said that it’s not really about the act of mixing the substance with water to get some physical benefit but rather about faith. Down the narrow curvy road we went and on to the Shepard’s Field. Another church with gorgeous mosaic paintings surrounded by an excavated area and park marked the spot where the Shepards of bible times hung out. These Shepards were blessed with the good news of Jesus’ birth, having heard the announcement from heavenly angels. The Shepard’s Field is also called Ruth’s Field. Ruth’s story is one of my favorites. Ruth and her mother-in-law were poor widows and they relied on the kindness of the local farmers who obeyed God’s law regarding setting aside corners of their fields for the poor to harvest. Ruth worked hard to glean the grain left behind after the harvest and caught the eye of Boaz, a good man who protected her and eventually became her husband. Boaz and Ruth are Jesus’ direct ancestors. 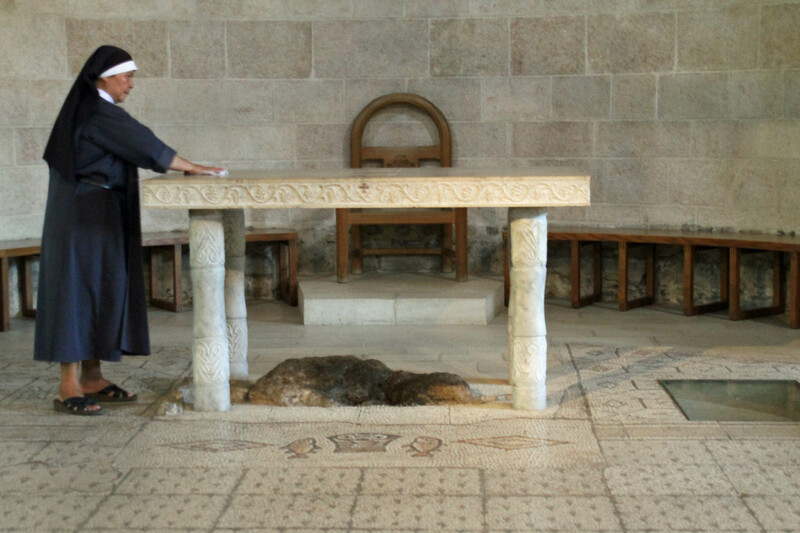 The spot under the altar marks the place of Jesus’ birth. Our next stop was the Church of the Nativity. This church was the only Christian holy site not destroyed in 614 A.D. by the invading Persians. Evidently they saw a mosaic on the church facade depicting the Magi dressed in Persian attire and thought it was a shout out to their prophet. Lots of crowds headed toward this seemingly non-descript church off the narrow street on top of one of the hills of Bethlehem. We entered single-file through a low-framed door and made our way over to an area that covered a cave. 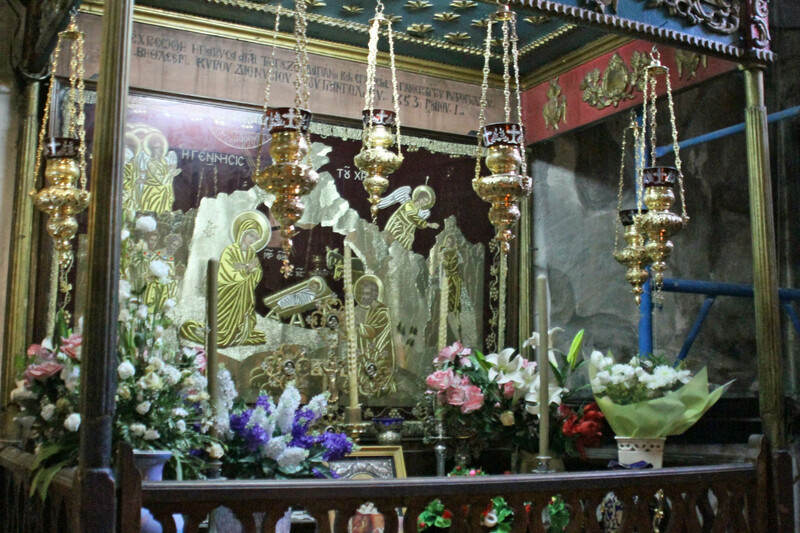 As with some of the churches in Jerusalem, the orthodox sects that had a presence within this church decorated the area with paintings, tarps, depictions of Mary, incense burners, and relics among other items. Dad has to stoop low to enter the Church of the Nativity. We waited in line to descend steps into a small area where there was an altar above the place where Mary gave birth to Jesus. 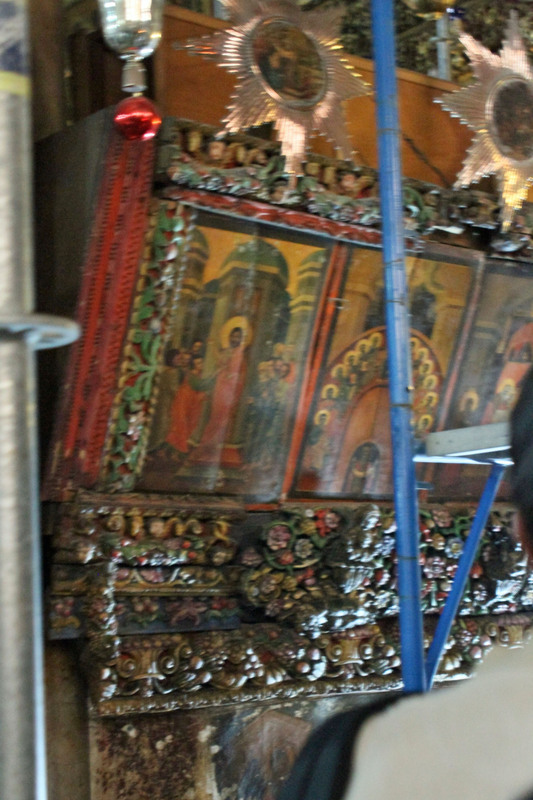 The walls were covered with thick tarp and there was another altar where a couple of priests were offering communion to a few visitors. We took our turn and bent down to touch the rock under the altar. I lingered for a few minutes wanting to breathe in the Holy Spirit and to try to meditate about this holy place and what happened there 2,000 years ago. But alas, with a tour group, we were moved along to walk through the church. Below one area was a cave where the holy family lived for a time and where Saint Jerome spent time meditating and translating the bible into Latin (the first time that was done). Our tour ended at Johnny’s gift shop where we found an assortment of goodies—many carvings of the nativity, crosses, and more from a special wood found locally. Not much wood is found in Israel, so this was somewhat unique. The afternoon was spent strolling through the Old City shopping before we started our journey east. I thought this was a little funny–a place near the Church of Nativity. One of the beautiful paintings on the walls of the church at the Shepard’s Field. A view of the Church of Nativity. Some construction was going on and it was tucked in off the street. 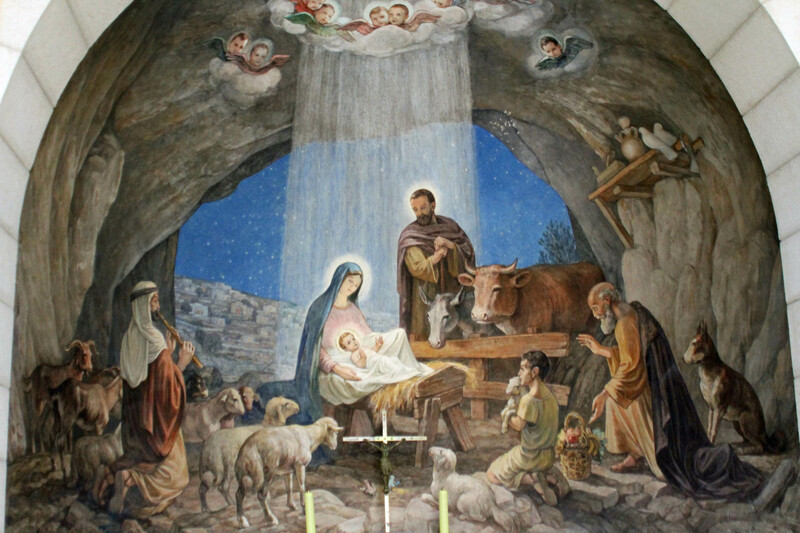 The lavish decorations adorning the walls over the entrance to the cave where Jesus was born. These items were in a case near the entrance to the birth cave. Down in the birth cave inside the Church of the Nativity, a small area was being used by some priests and nuns for prayer and communion. 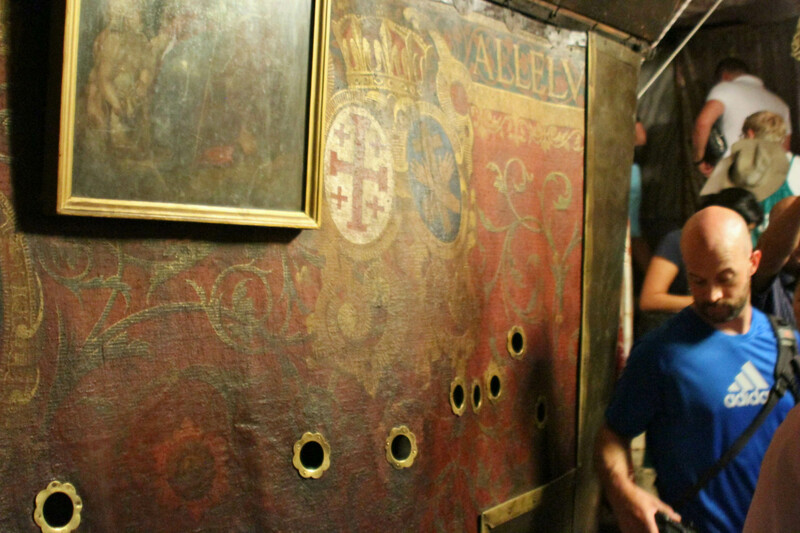 Down in the cave on the walls around the rock under the altar where Jesus was born, tapestries and paintings hung. 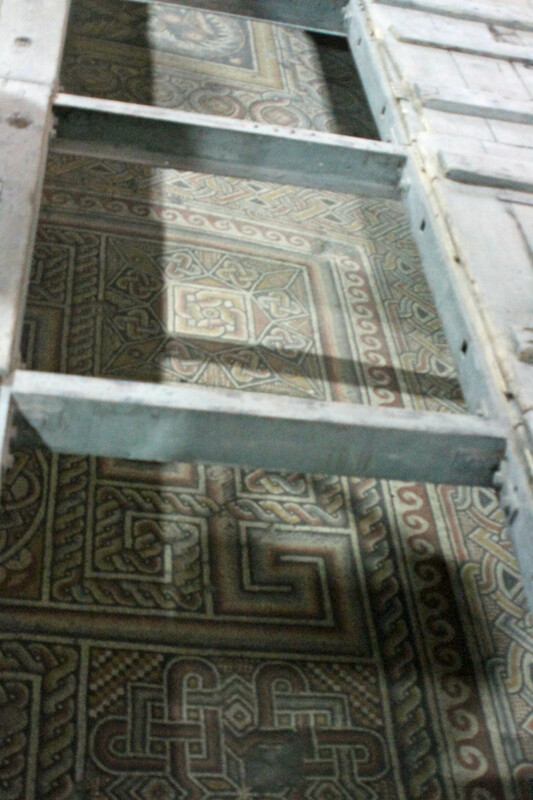 This beautiful mosaic floor is partially uncovered in the Church of the Nativity. 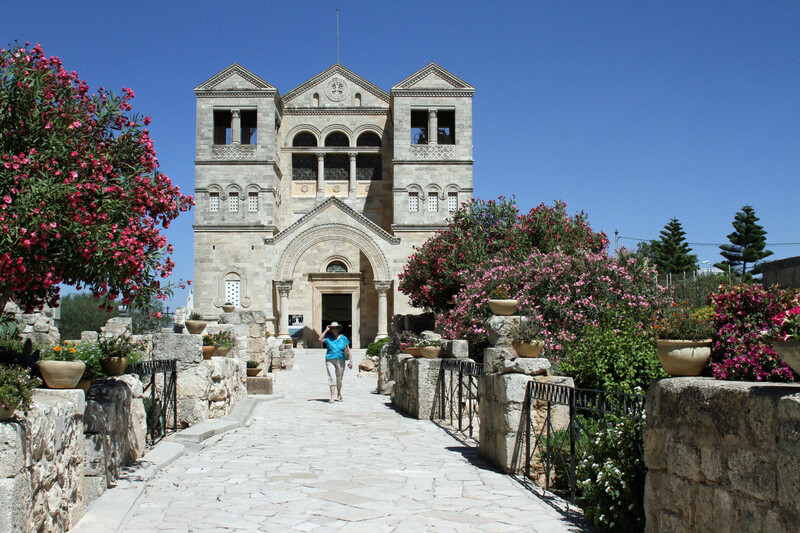 Leaving the area where the birth cave was located and walking into another church connected to it where the holy family lived. 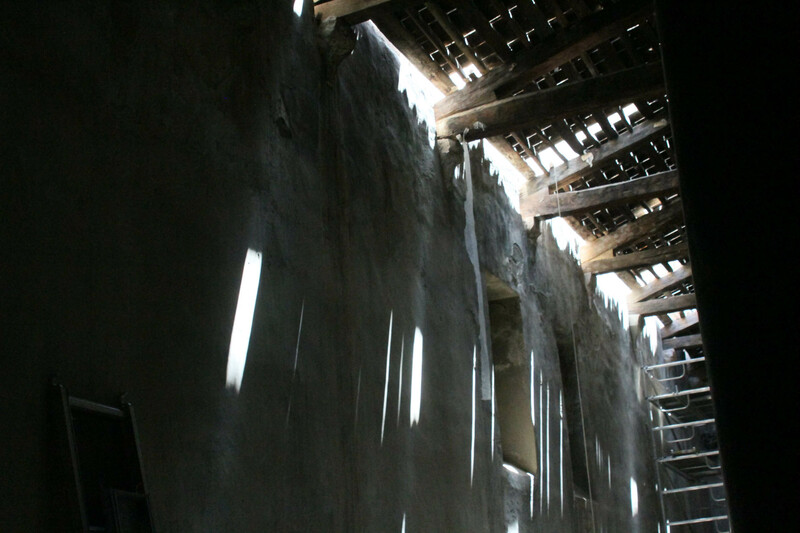 The walls reflect the light coming through slats in the roof.